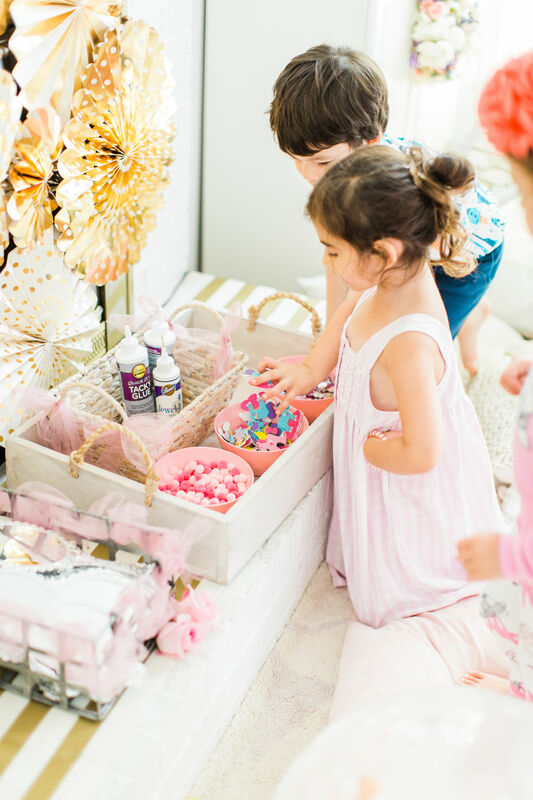 Scarlett's 4th Birthday Princess Pajama Party | Glitter, Inc.
Ready to throw one beautiful and memorable princess pajama birthday party? 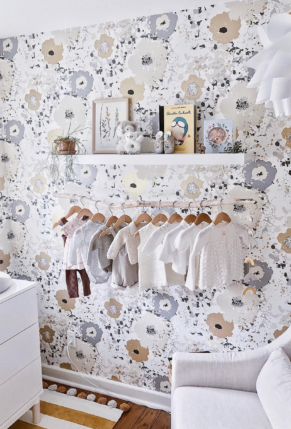 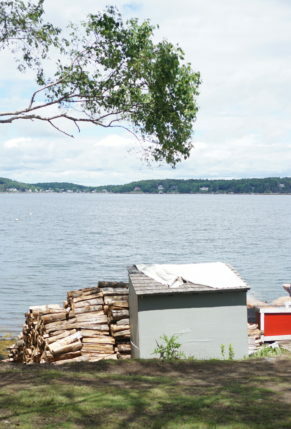 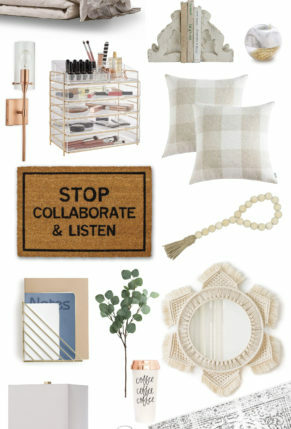 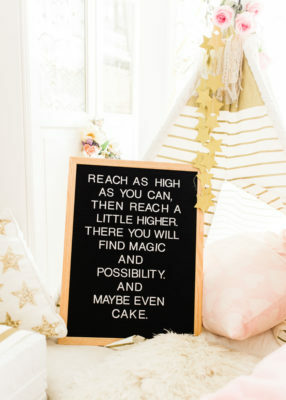 Have we got some inspiration for you! 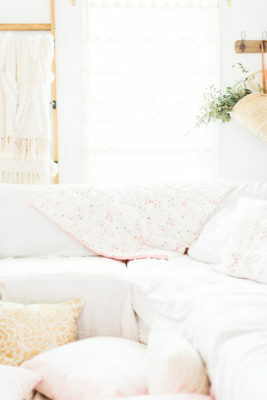 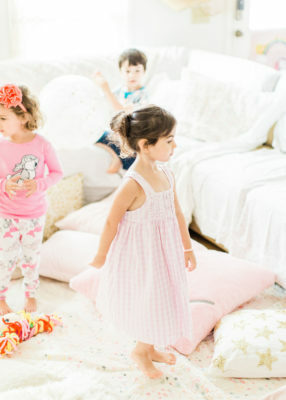 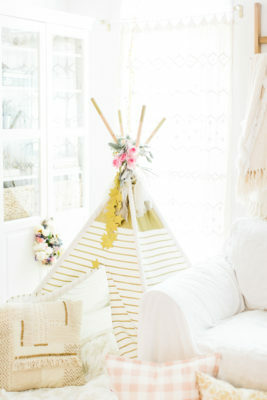 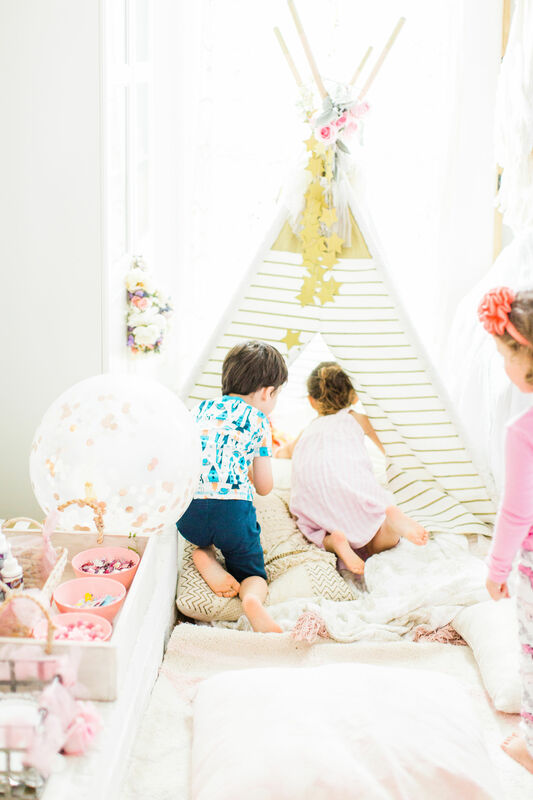 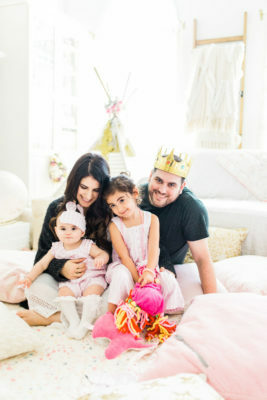 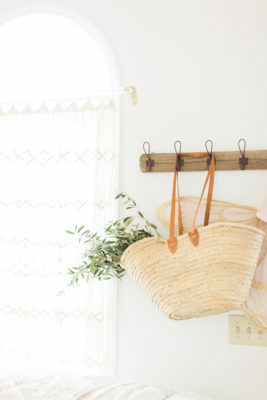 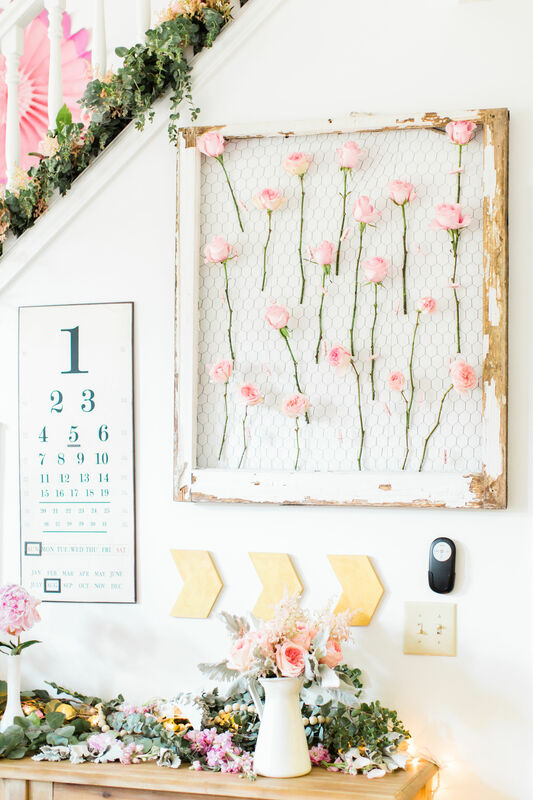 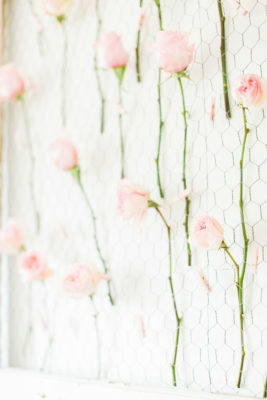 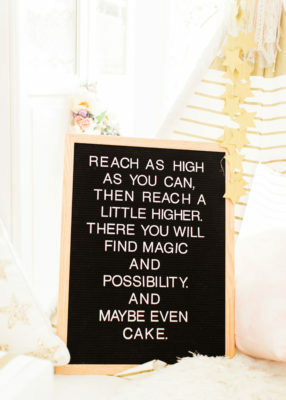 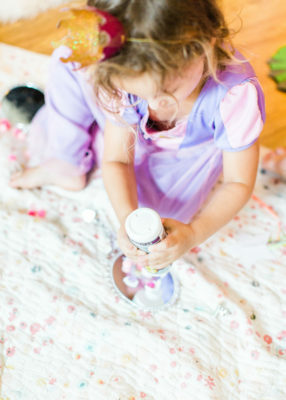 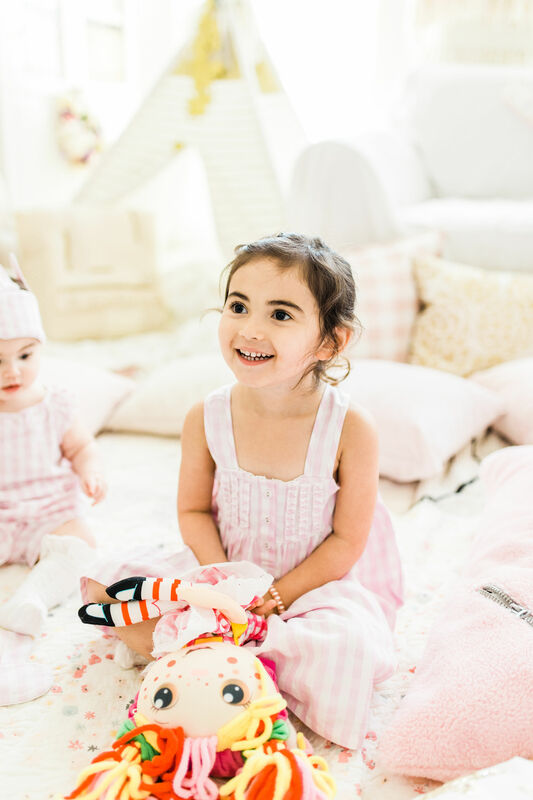 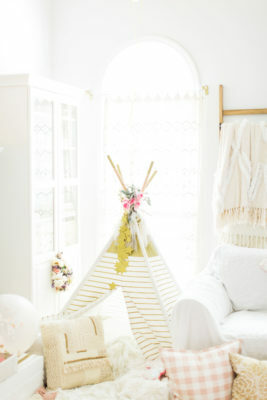 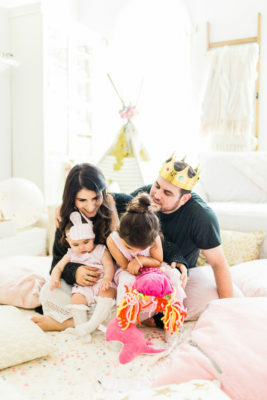 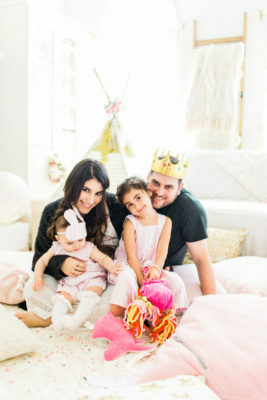 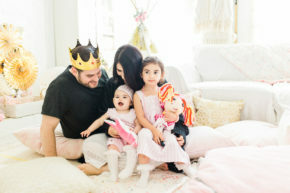 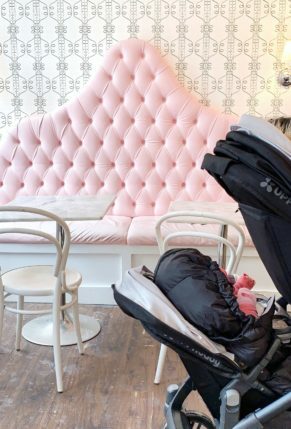 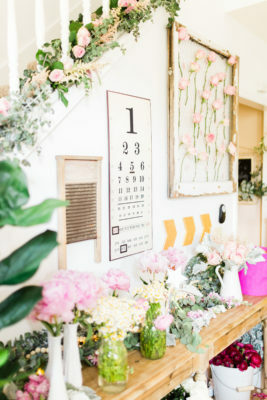 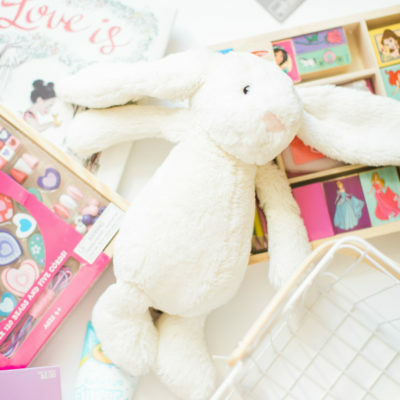 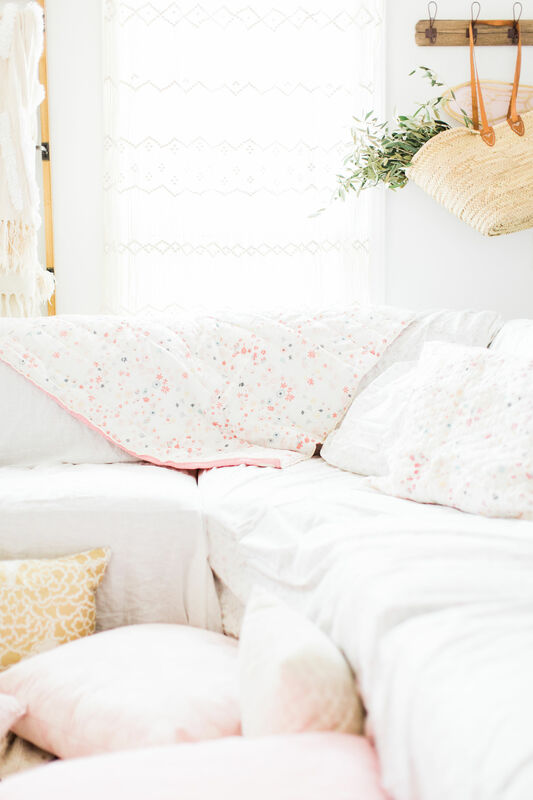 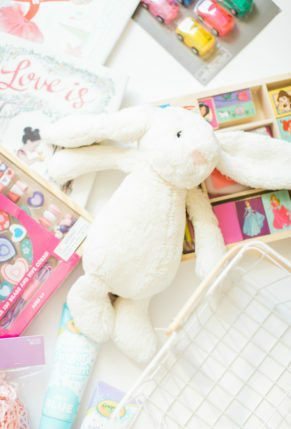 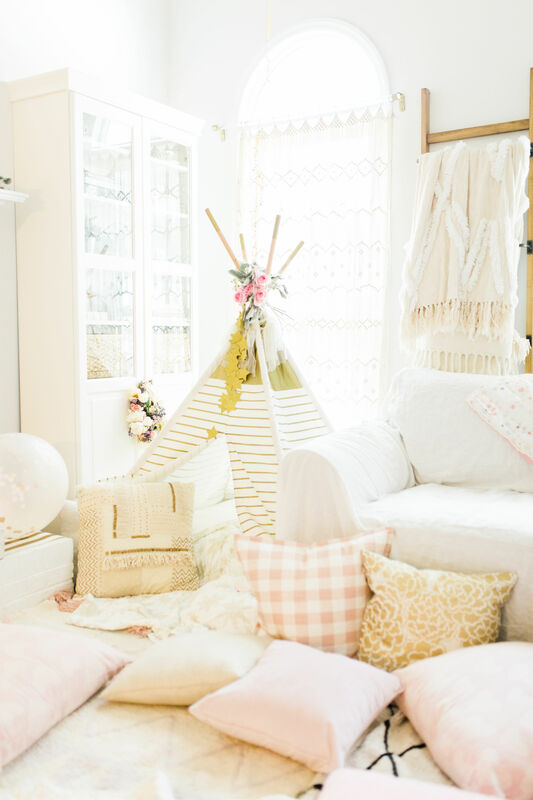 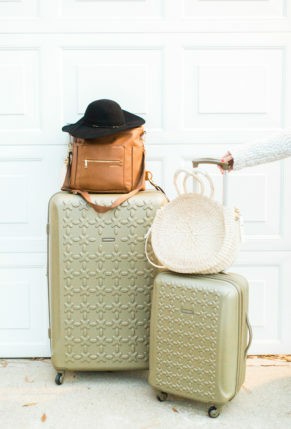 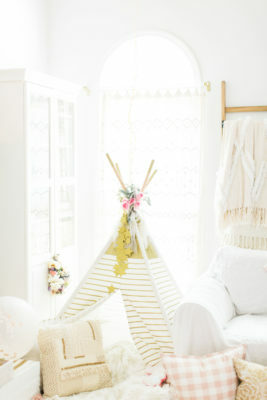 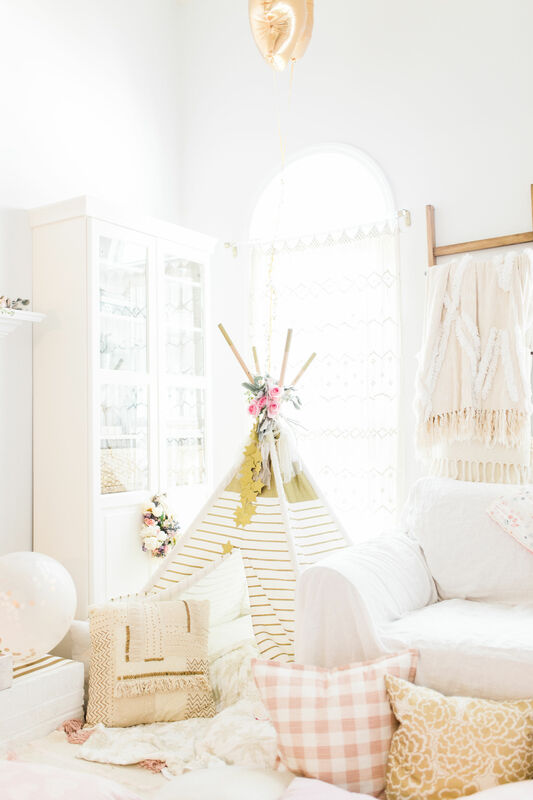 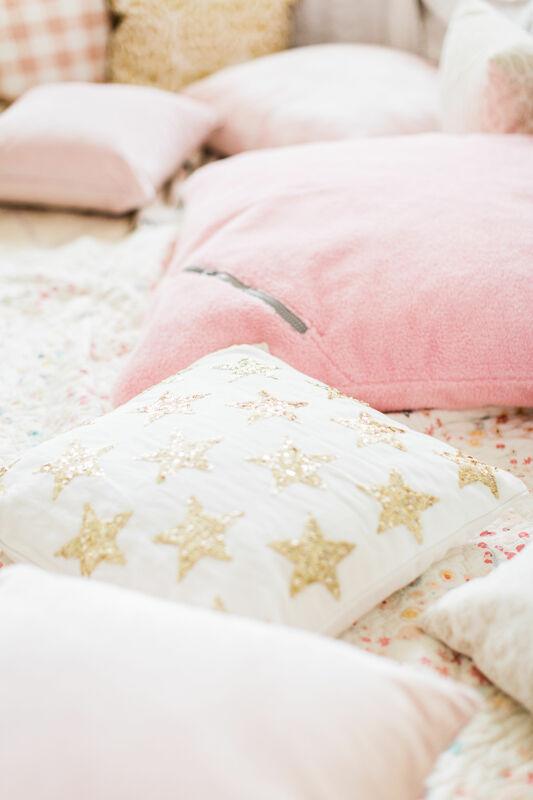 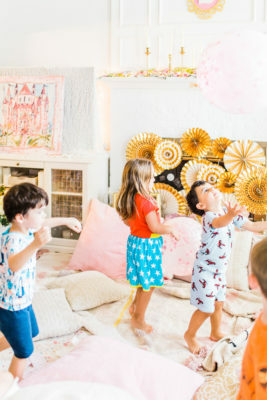 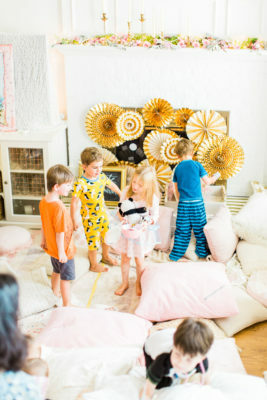 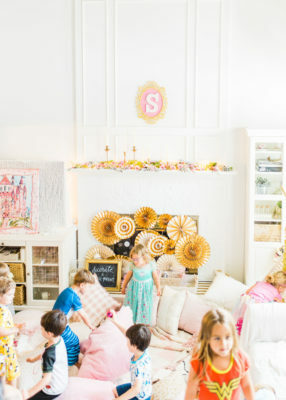 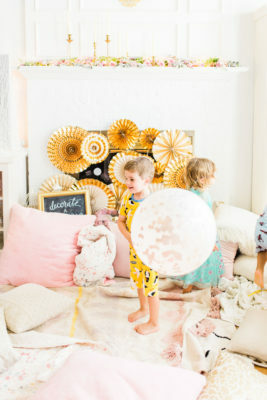 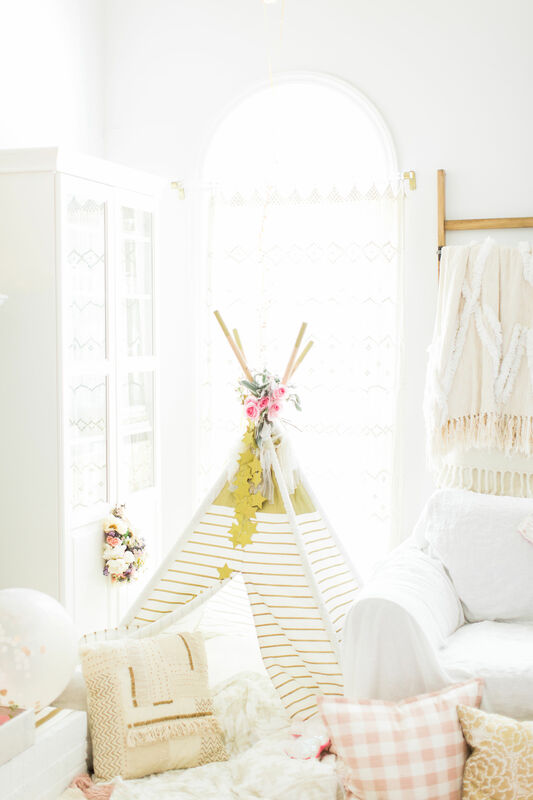 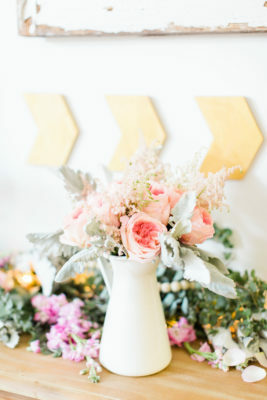 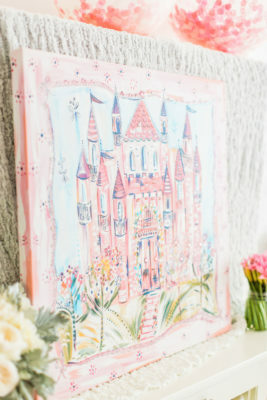 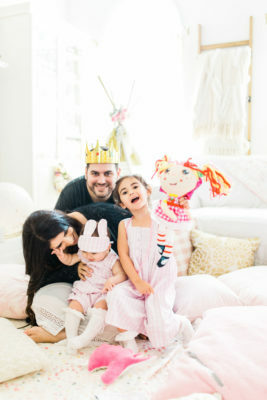 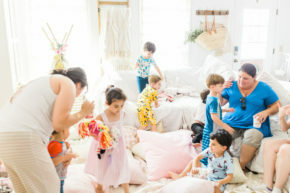 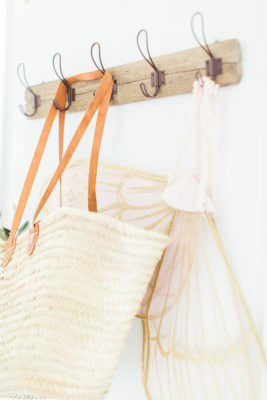 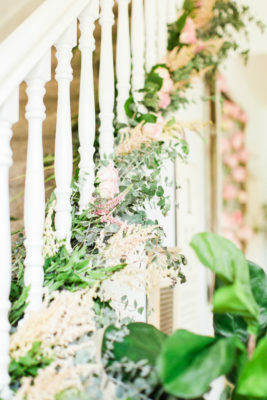 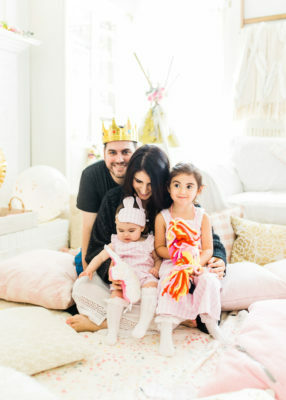 We turned our living room into one giant “slumber party” and covered every available space with sheets, pillows, and blankets, plus gorgeous pink florals, a cozy tent lounge, a DIY magic mirror decorating activity for the kids, a dress-up station with crowns, wands, and wings, a pin the tail on the unicorn game, and so much more. 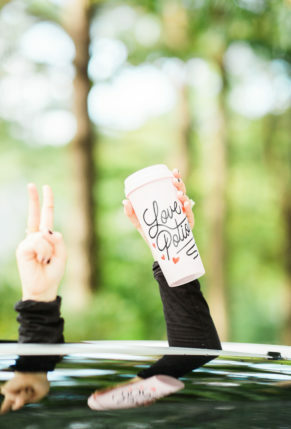 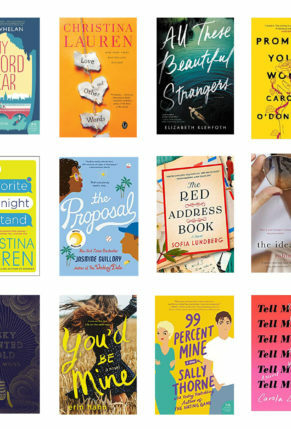 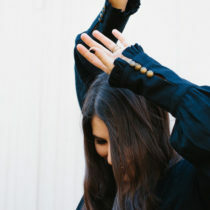 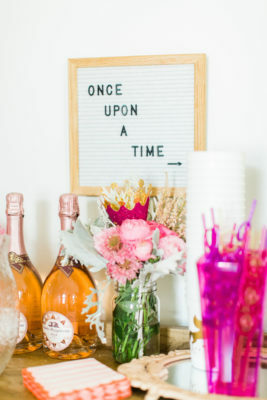 *Side note: It’s SO exciting when a party we put together with so much love is featured on a huge site. 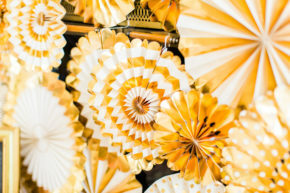 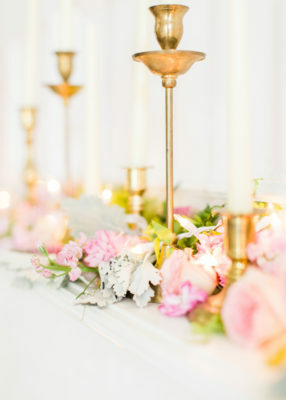 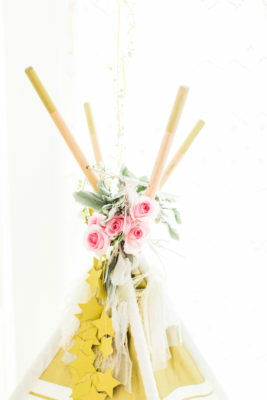 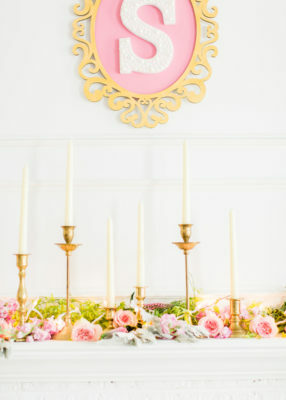 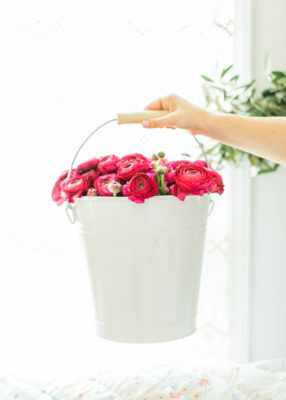 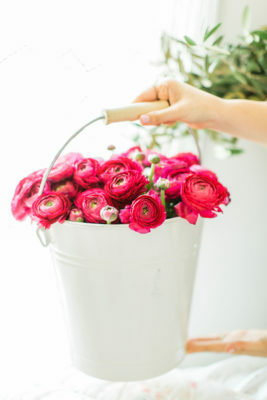 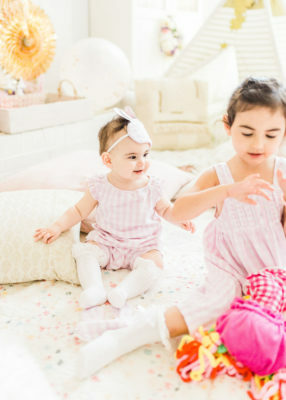 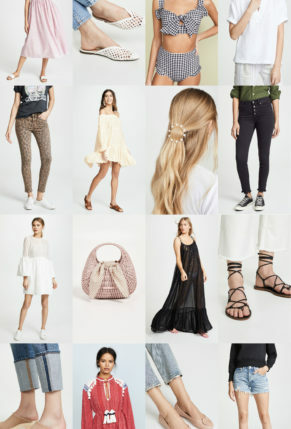 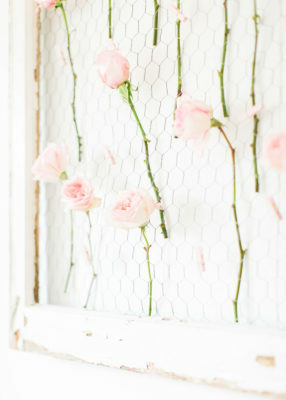 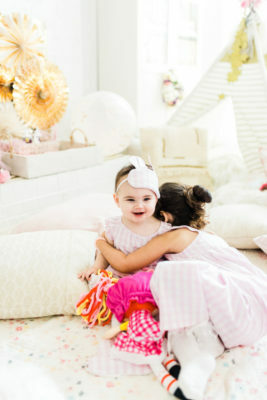 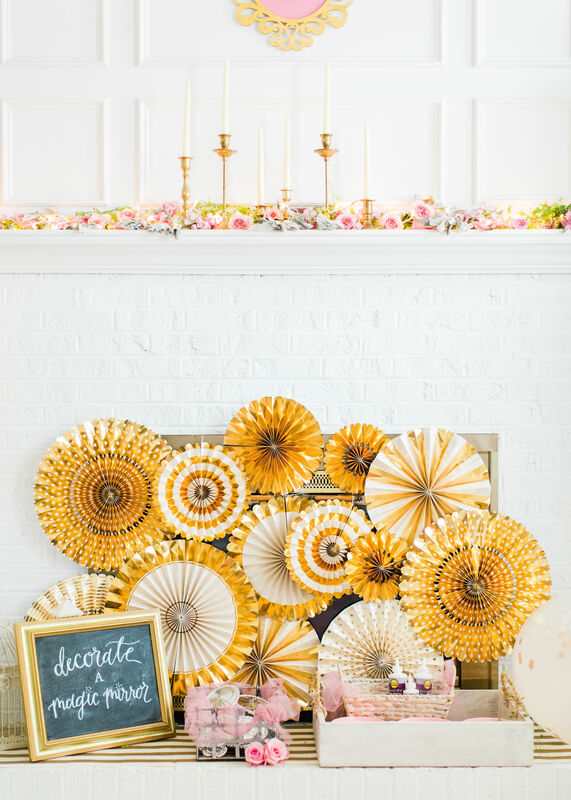 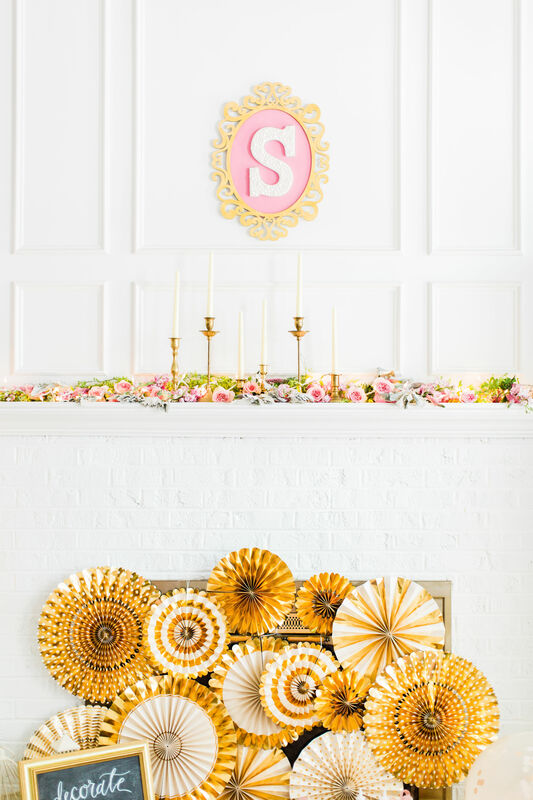 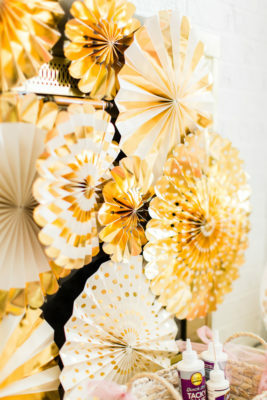 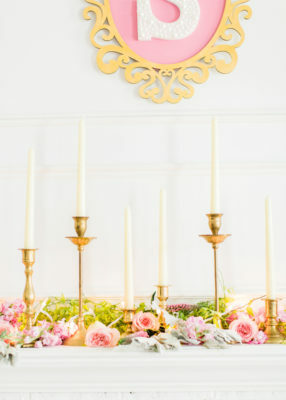 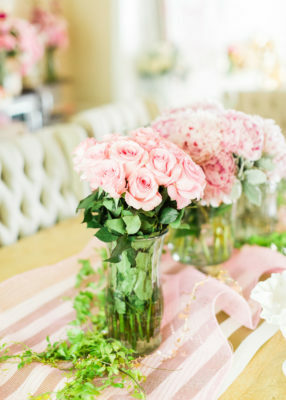 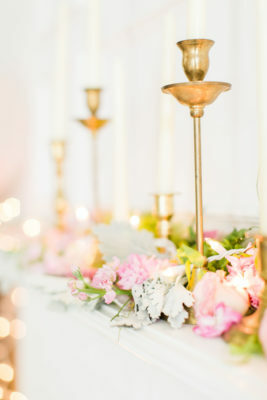 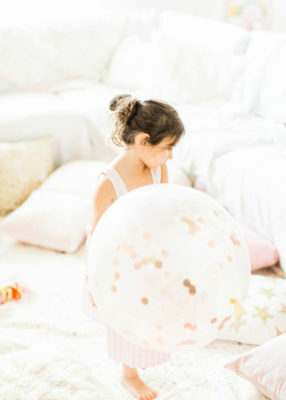 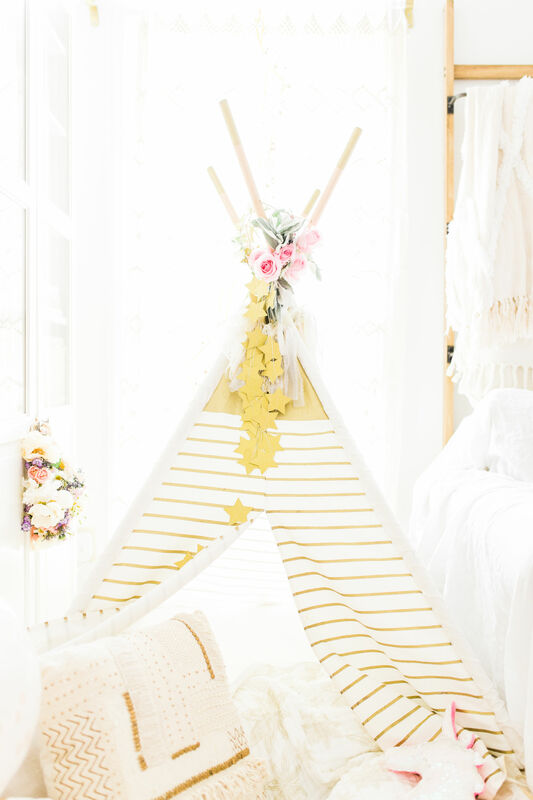 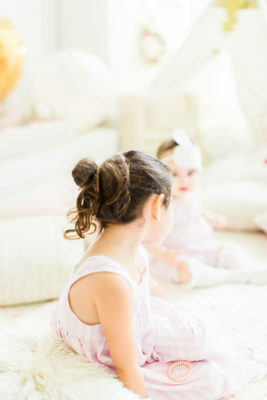 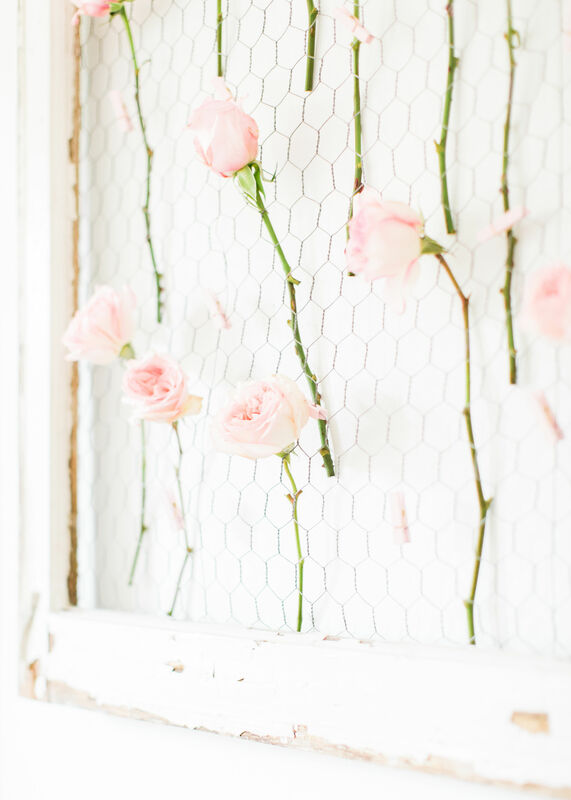 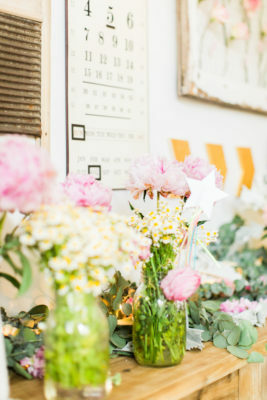 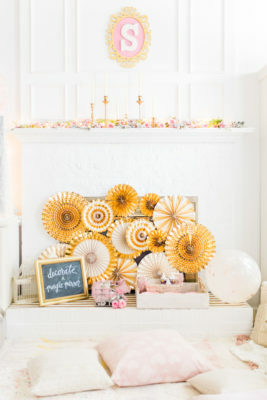 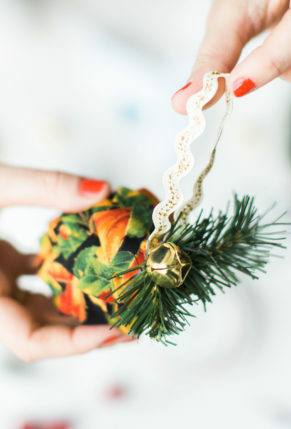 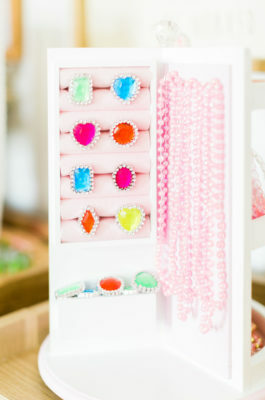 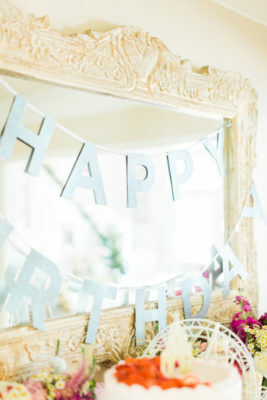 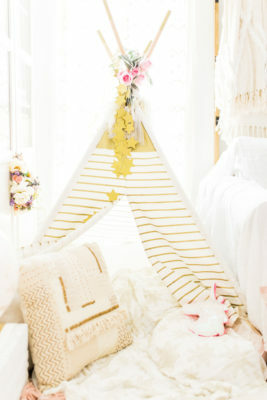 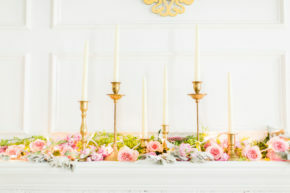 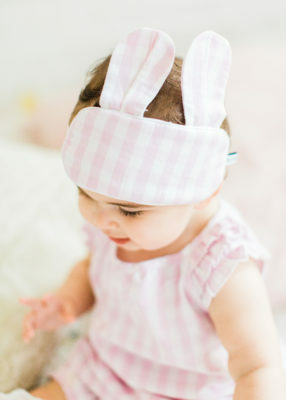 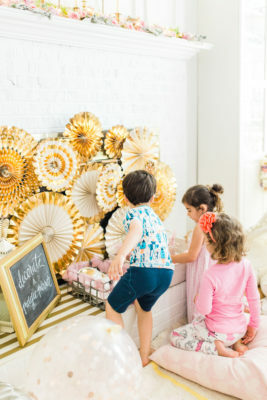 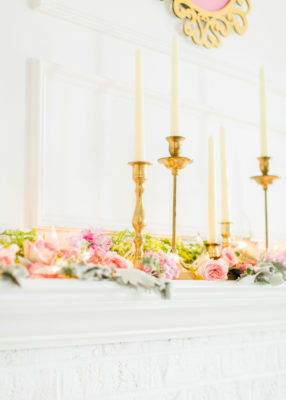 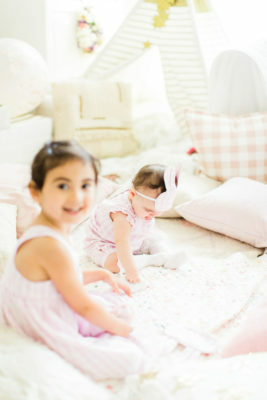 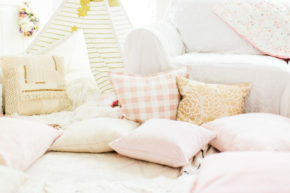 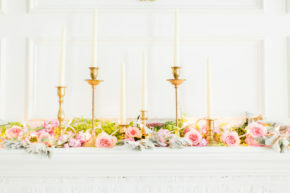 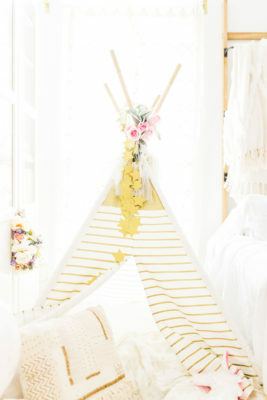 We’ve had parties featured on Style Me Pretty, Inspired By This, Ruffled, and more; and still, it never gets old! 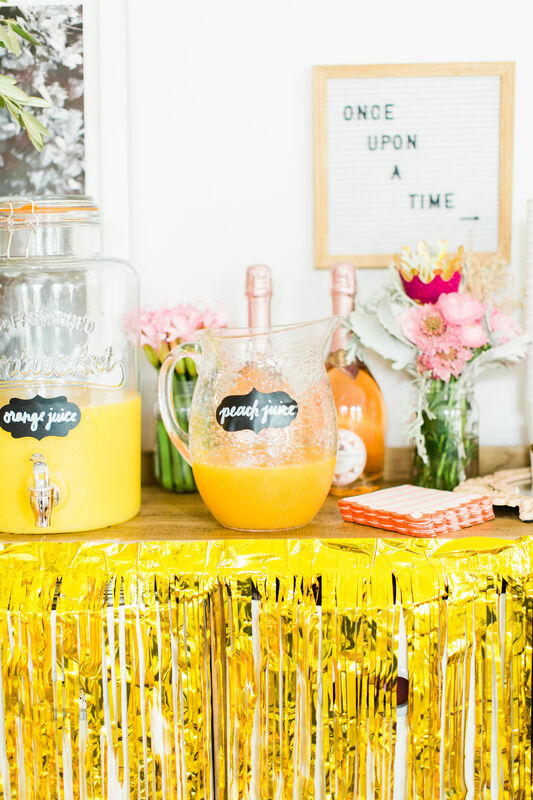 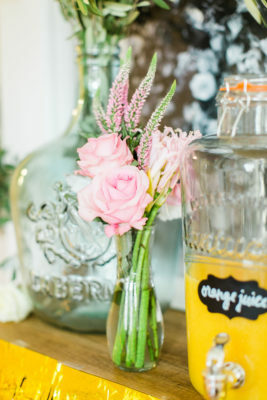 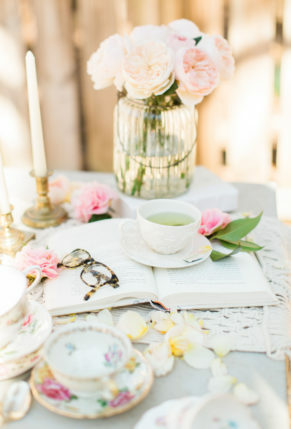 Any time we dream up a party, we start with a general theme. 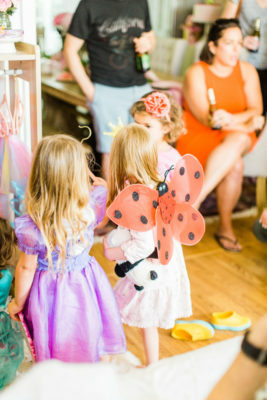 Now that Scarlett is 4, she has her own opinions about her parties (which I LOVE), and she 1,000% knew it had to be a princess party. For Scarlett’s 4th birthday party, we knew we wanted to do something a little bit different. 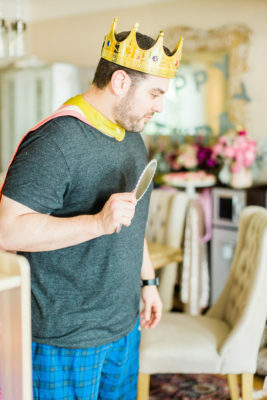 I was hoping to steer clear of the more generic princess party, while still making it just what our four year old wanted. I thought a lot about how we play. 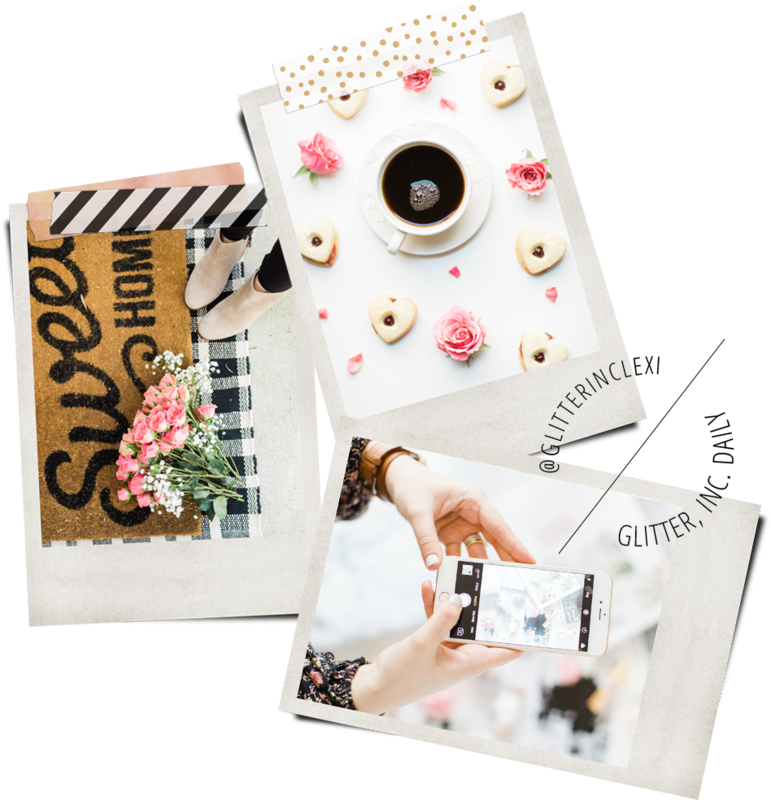 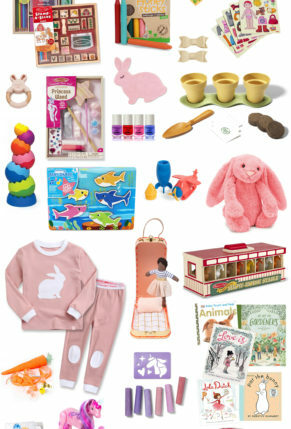 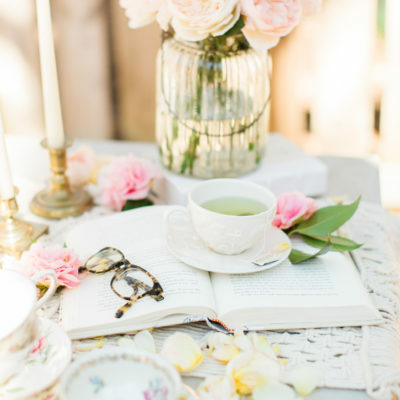 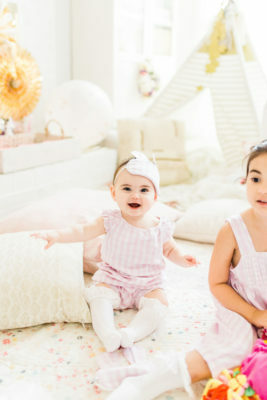 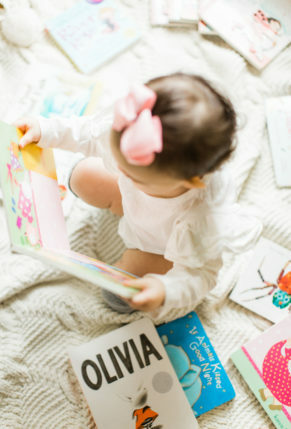 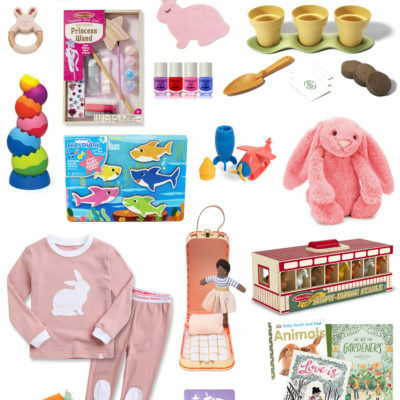 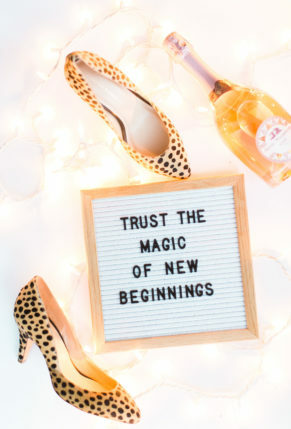 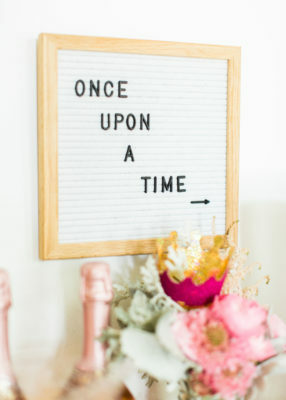 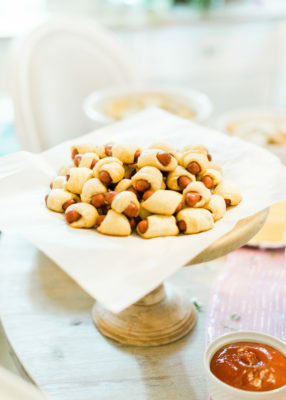 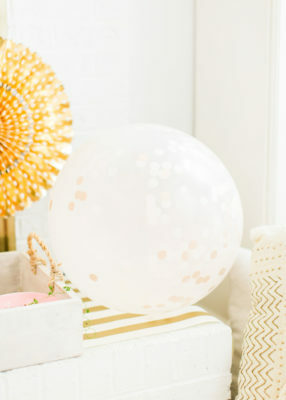 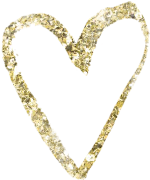 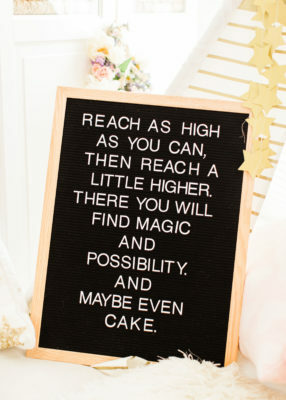 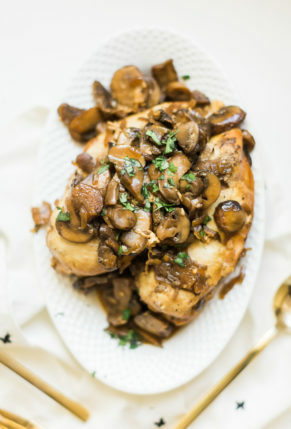 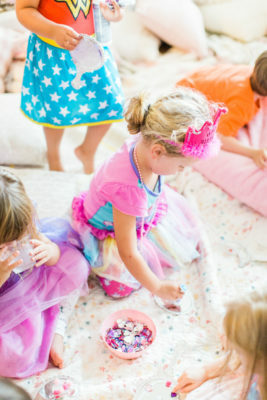 As I do for all of our parties, I went to Pinterest and immediately started creating an inspiration board where I pinned a bunch of beautiful party ideas that could work with our pajama princess party theme. 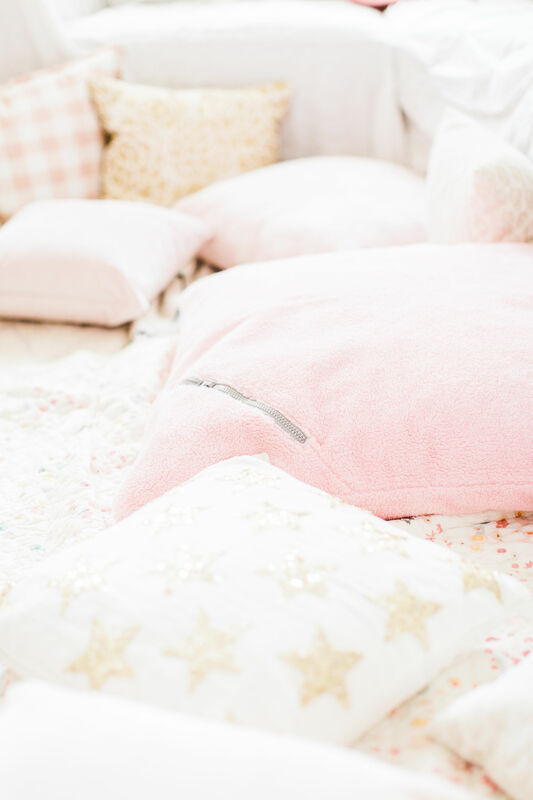 A few days before the party, we started to transform our home into the coziest, pinkest princess pajama party hangout we cold dream up. 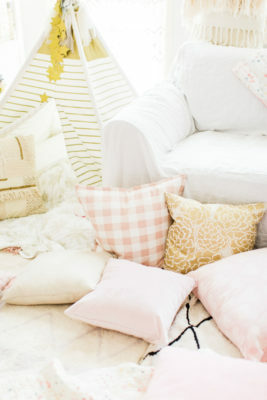 To get the full comfy, pillow fort effect, we covered the living room in cozy supplies. 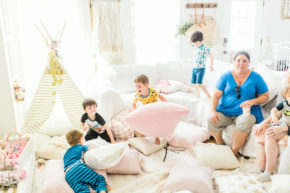 Our entire sectional sofa was covered in sheets, we layered blankets and quilts all over the floor, and propped up pillows and set down oversized floor cushions everywhere. 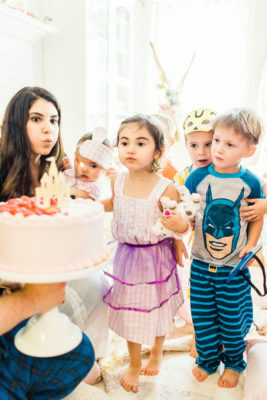 Just look at this happy birthday girl! 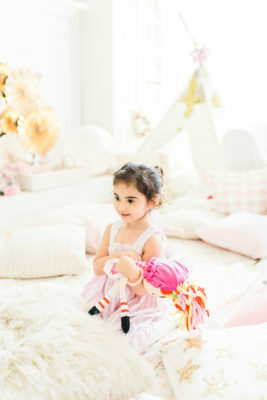 And of course, her cutie patootie little sister. 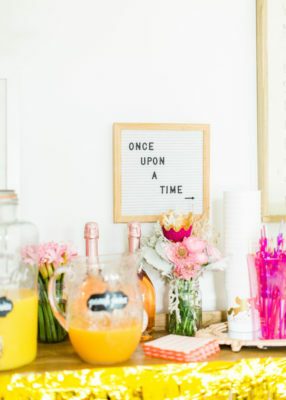 Now let’s talk party details! 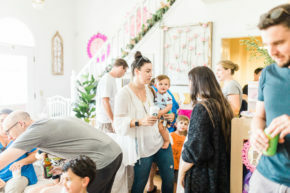 We even had parents arriving in their favorite jammies. Also, we set up baskets around the room, filled with paper crowns and wands, giving everyone the chance to dress like royalty for the afternoon. 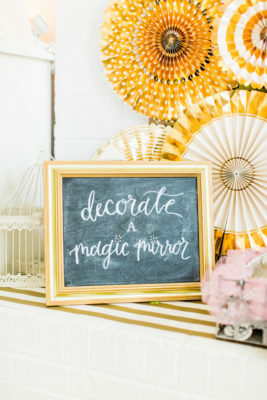 We had a “DIY Magic Mirror” station set-up. 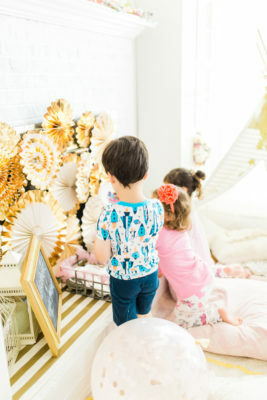 Over there kids could decorate their mirrors with glitter puff paints and glue gems, jewels, pom poms, and princess foam stickers to the mirrors. 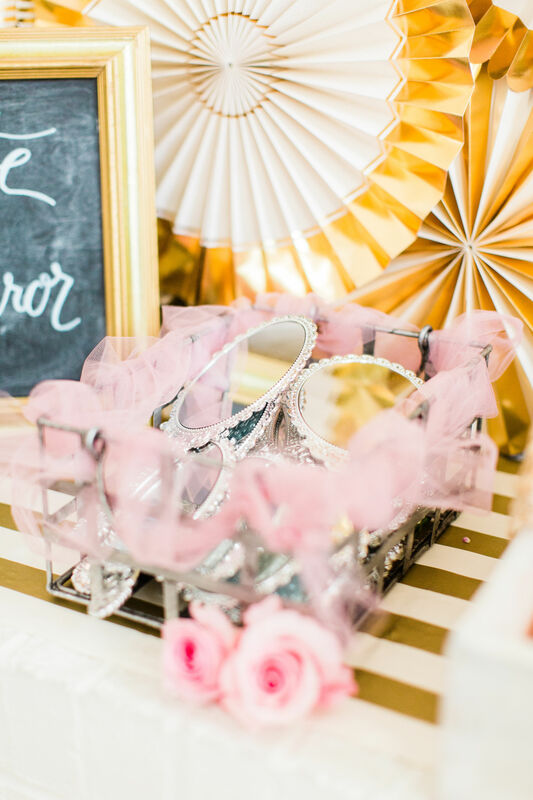 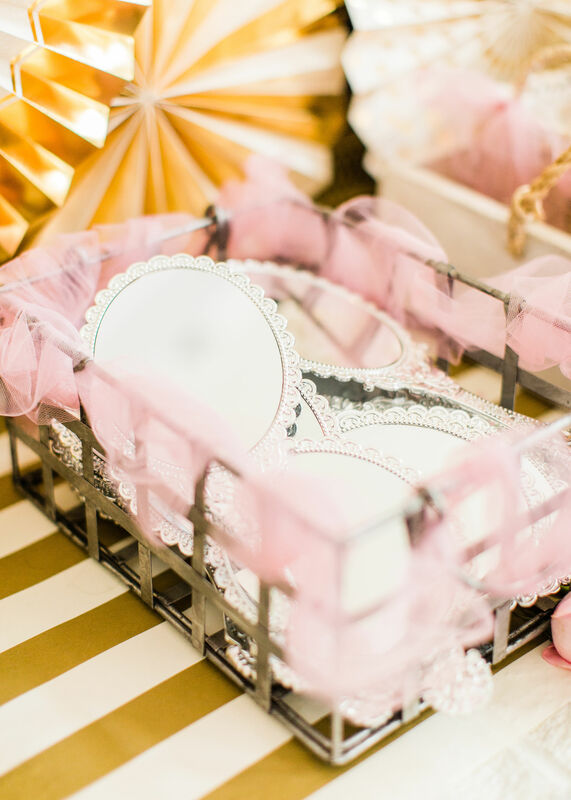 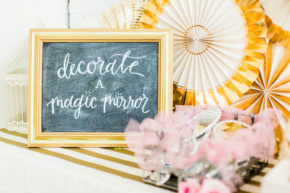 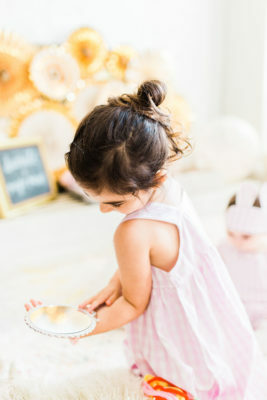 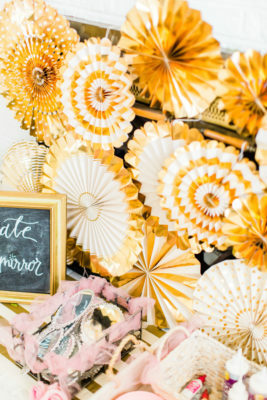 The DIY magic mirrors were the perfect party favor, and kids of all ages got in on the DIY action. 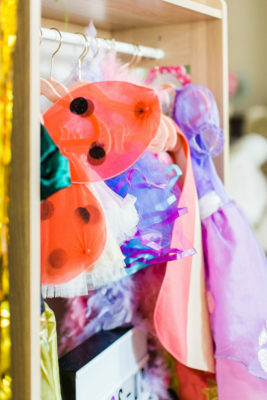 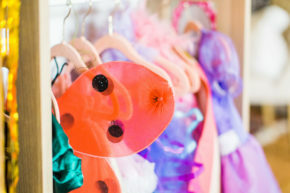 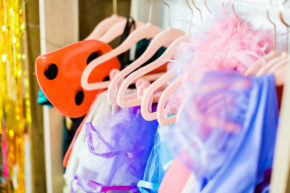 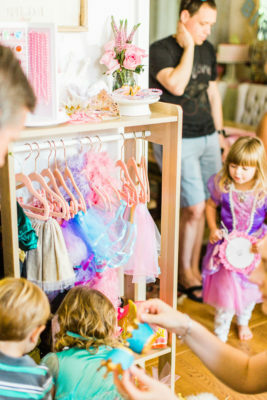 We created a princess (and prince) dress-up station using an inexpensive kid-size garment rack we found on Amazon, stocking our dress-up closet with tutus, wings, masks, capes, wands, crowns, and play jewelry like beaded necklaces, bracelets, and sparkly rings. 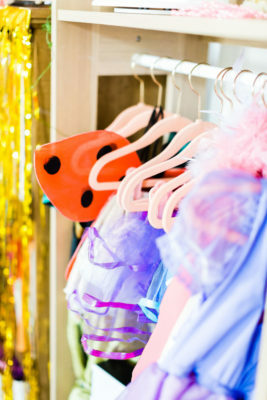 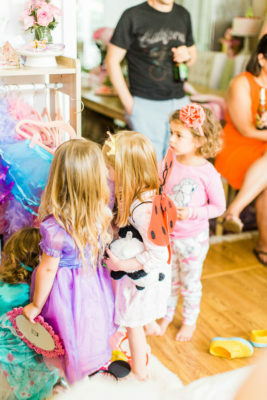 The kids had a blast dressing up and everywhere you looked, someone was bouncing by in tulle and glitter. 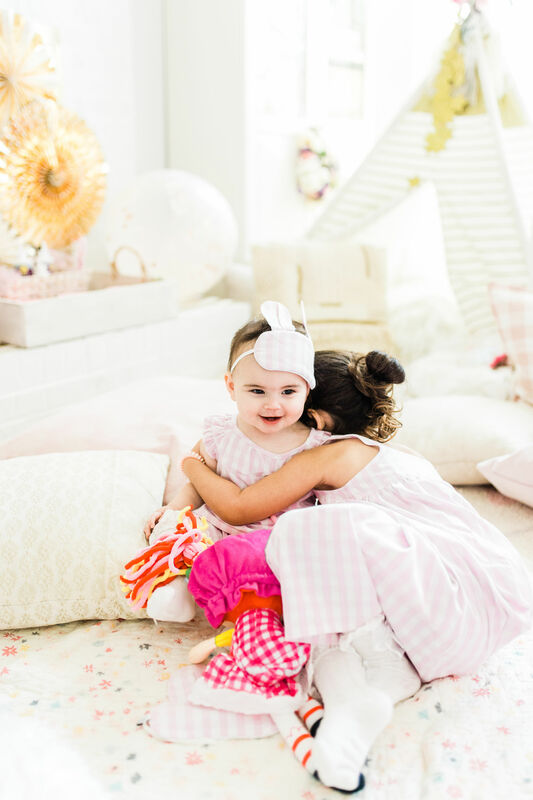 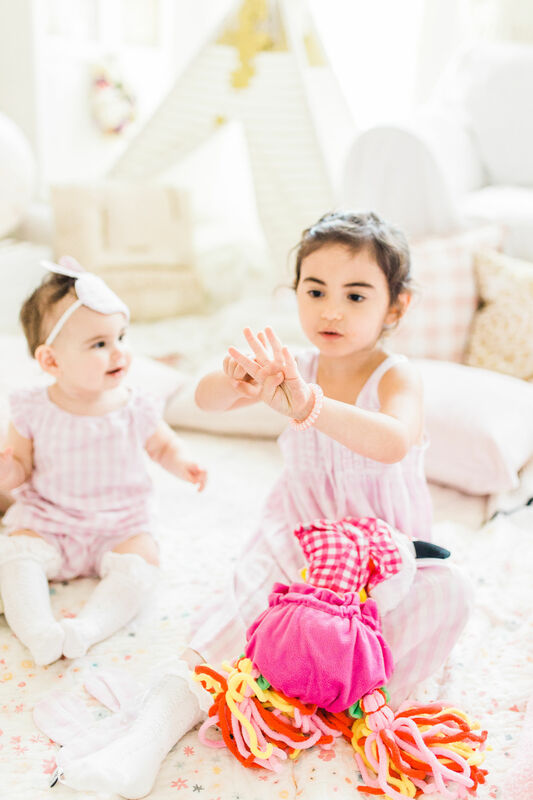 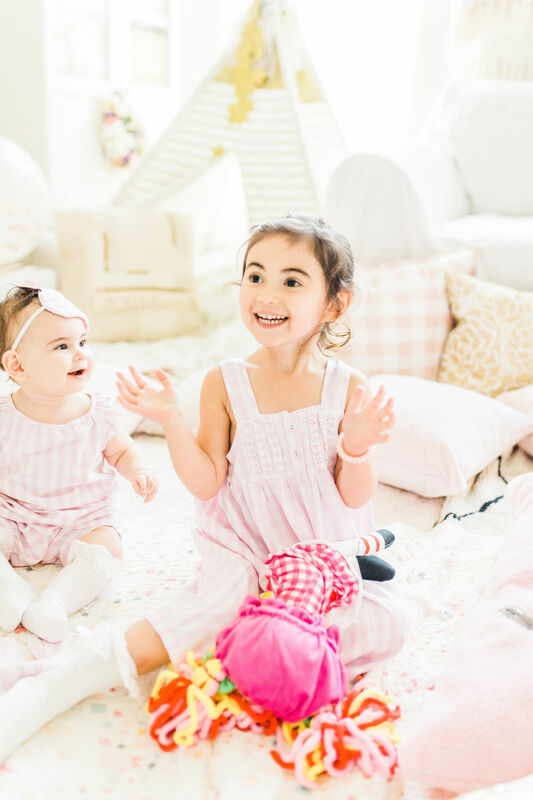 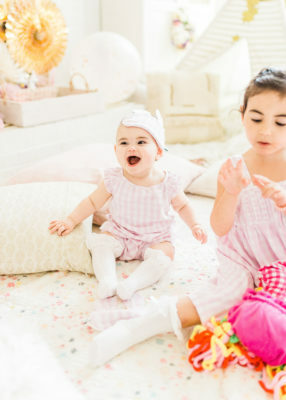 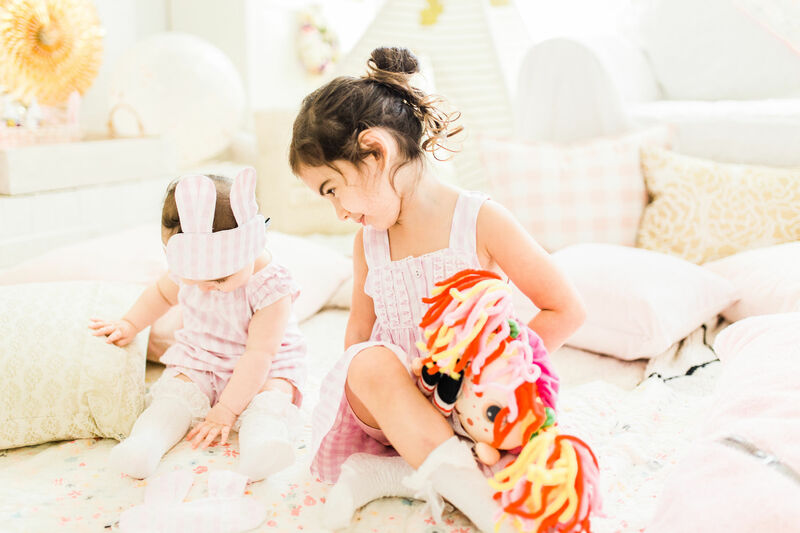 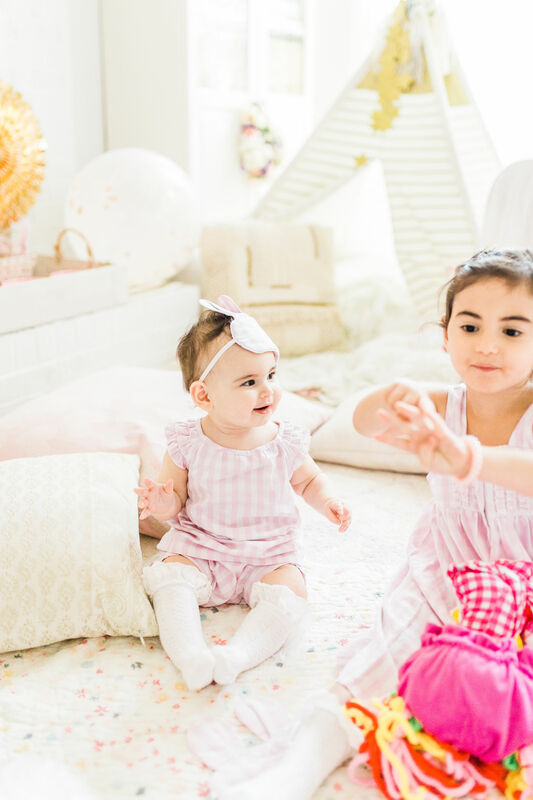 And … BONUS … the girls are loving their new dress-up closet since the party! 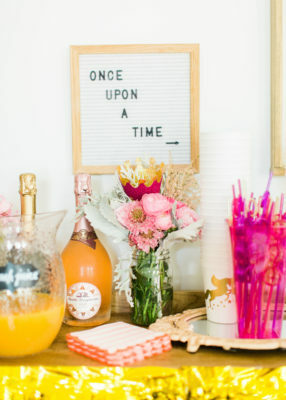 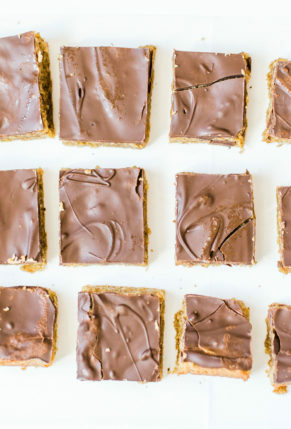 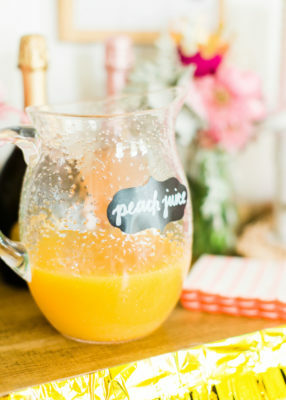 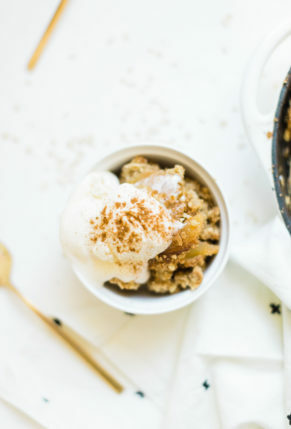 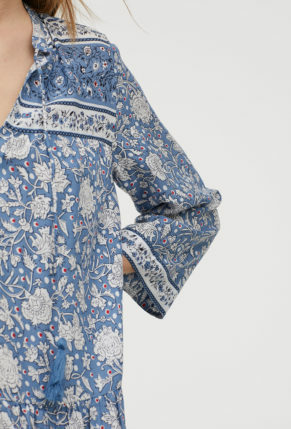 Because we were channeling the best ever pajama party, the menu was a nod to brunch. 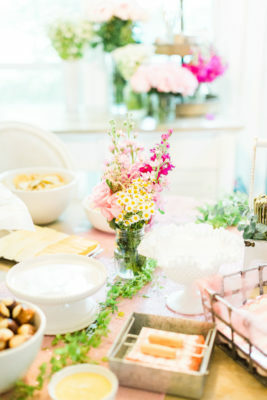 We served pretzel bites, pigs in a blanket, mini quiche bites, cheese and crackers, artichoke dip and pita chips, veggies, and my mom’s famous crème brûlée french toast casserole. 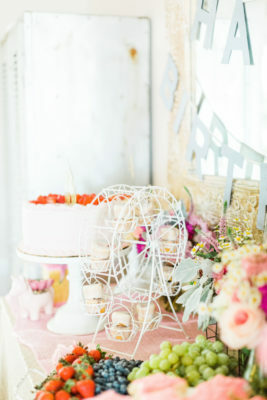 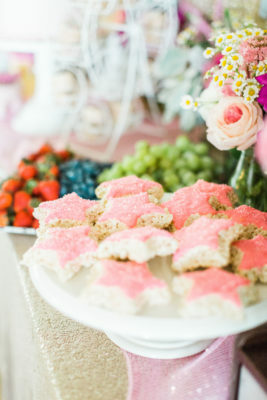 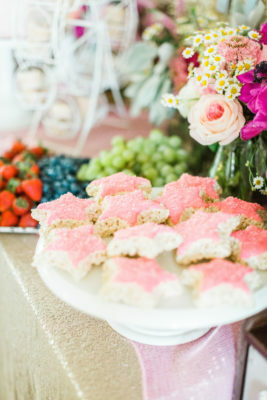 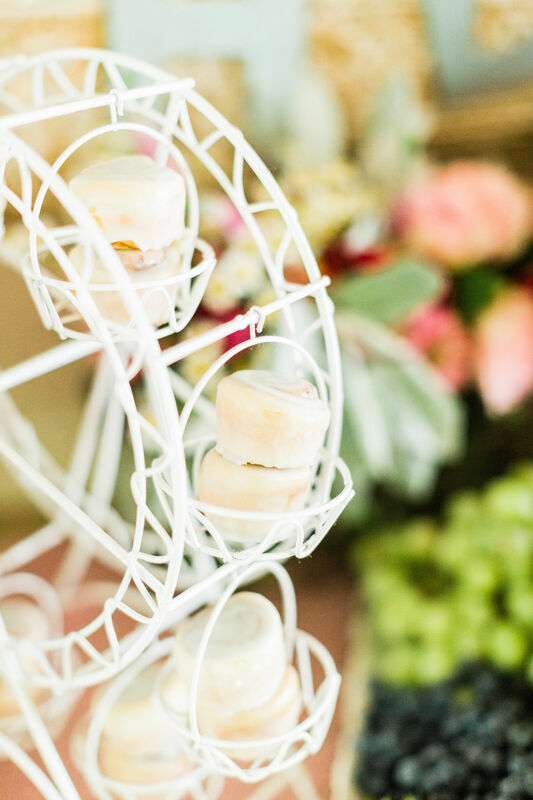 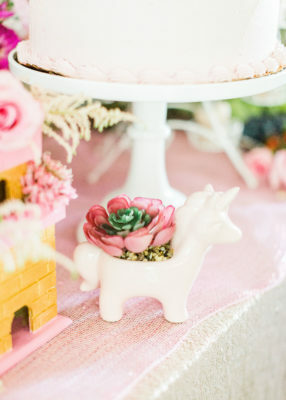 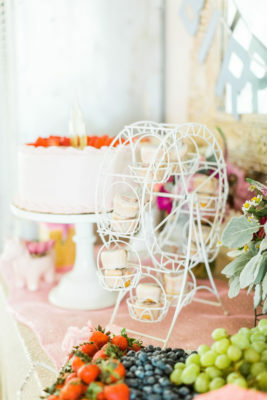 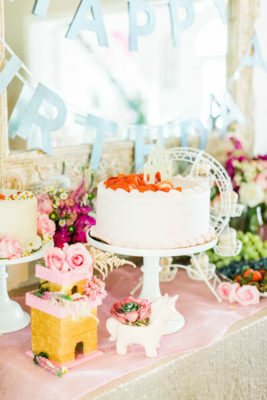 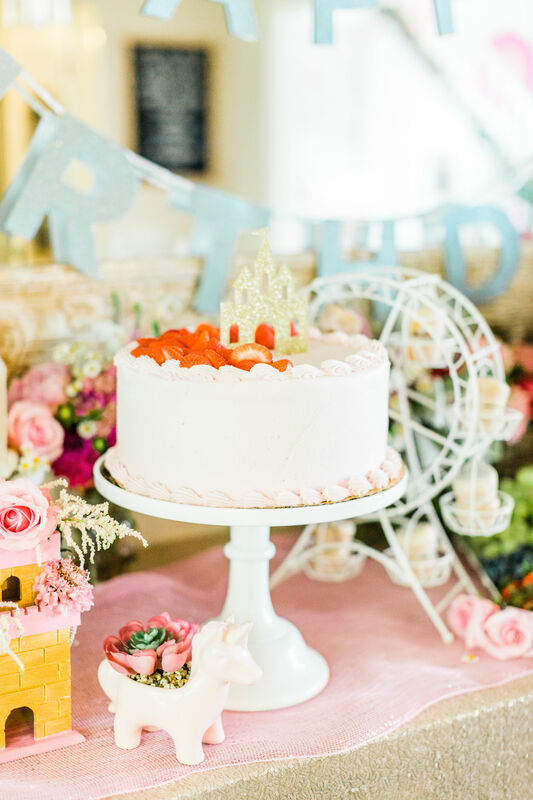 The dessert station was stocked with two cakes – one chocolate and one strawberry, pink frosted star rice krispie treats, a carousel of mini cinnamon buns, cookies, a huge spread of fruit, and a unicorn for good measure. 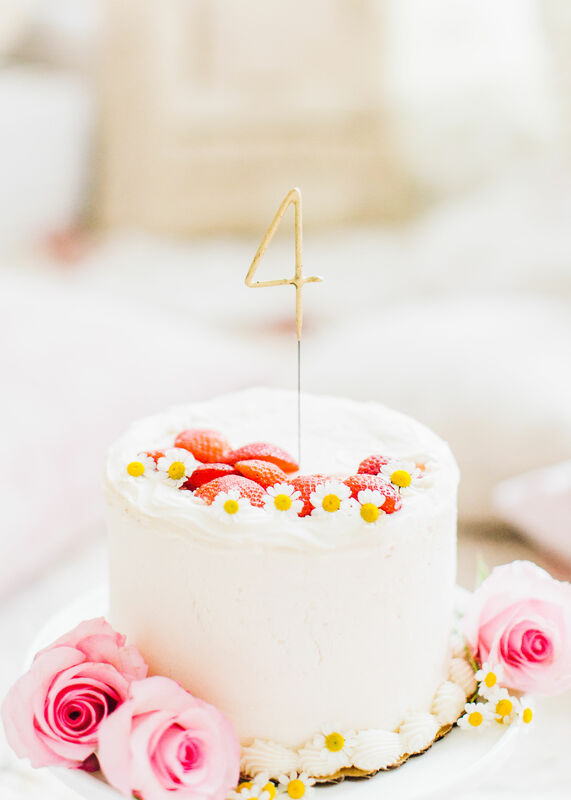 And of course, singing “happy birthday” with a “4” sparkler! 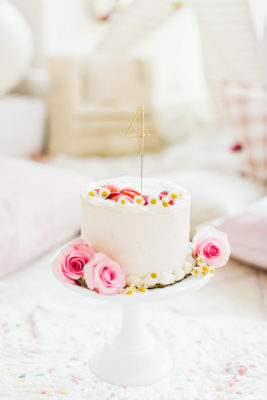 Vegan Whole Foods cake for the win. 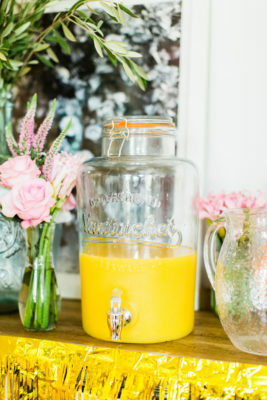 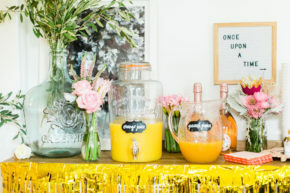 The grownups had their own “royal drink station” complete with everything they’d need to make mimosas and bellinis, plus craft beer and sodas. There were juice boxes and waters for the kids as well. 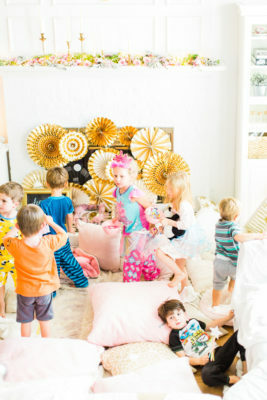 The party was a huge success, and the kids had such a fun time dressing up, creating magic mirrors, playing games, and bouncing from pillow to pillow in our giant slumber party room. 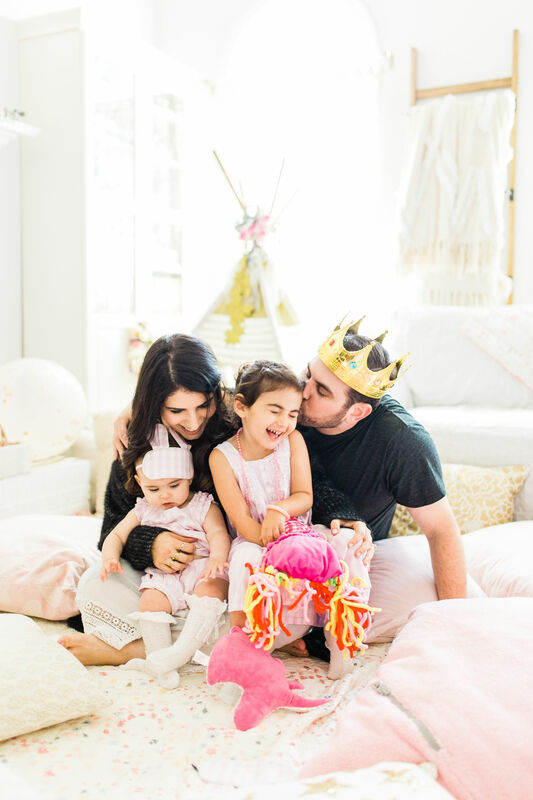 I am so in love with this little family of mine. 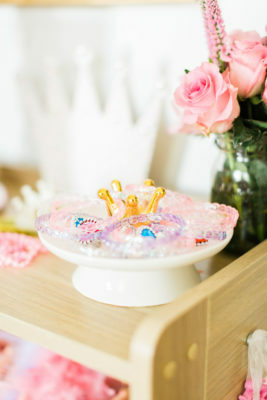 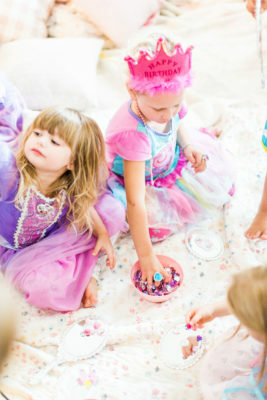 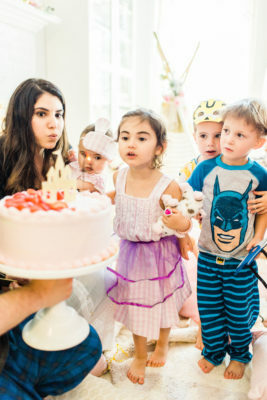 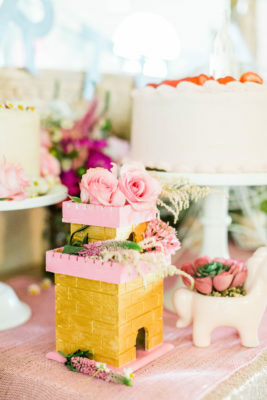 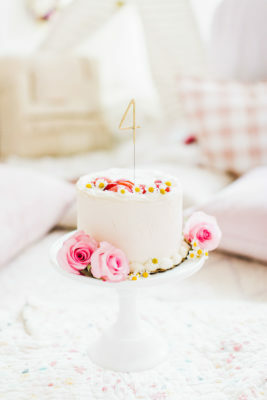 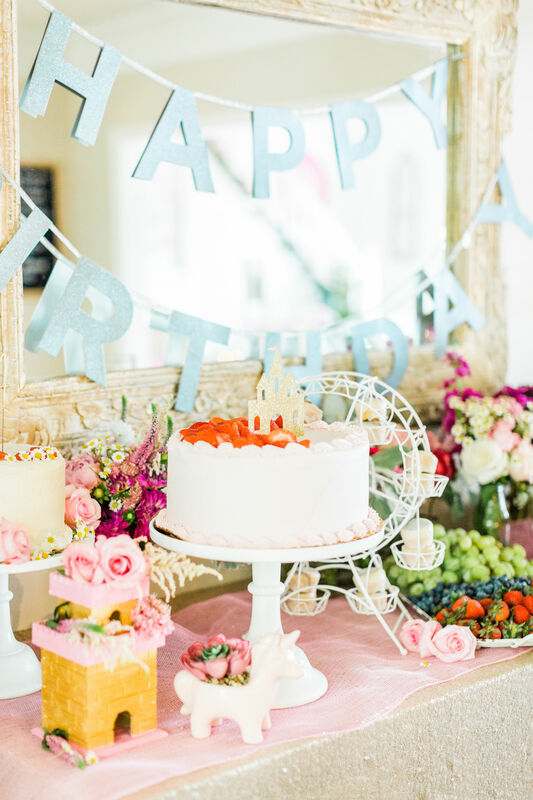 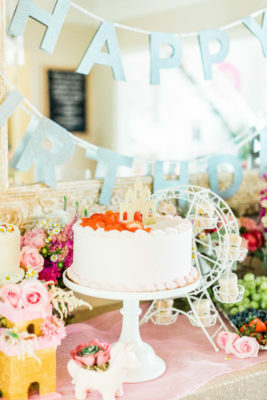 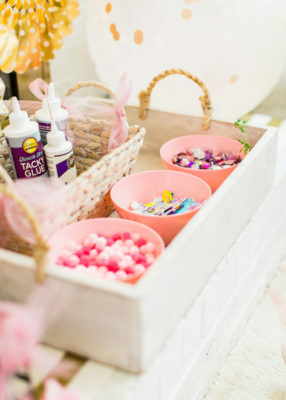 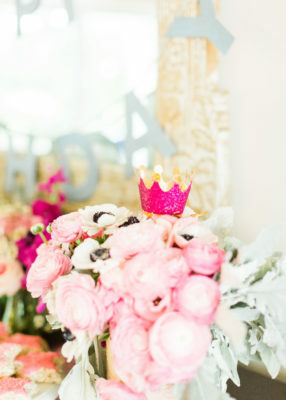 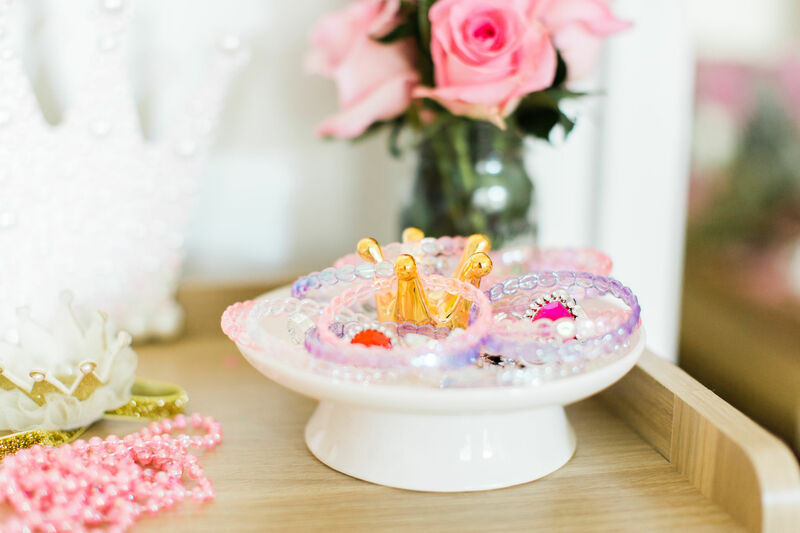 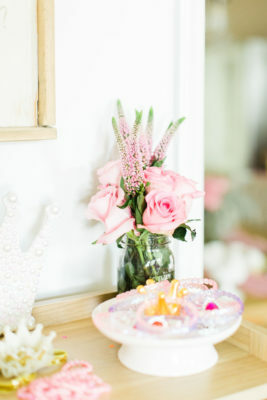 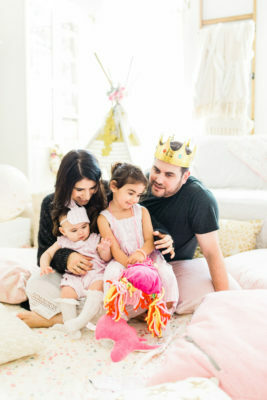 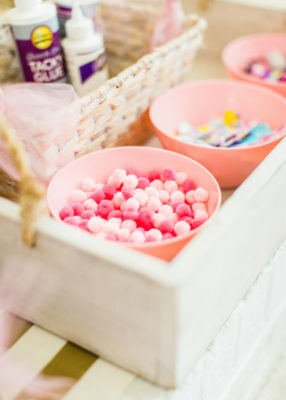 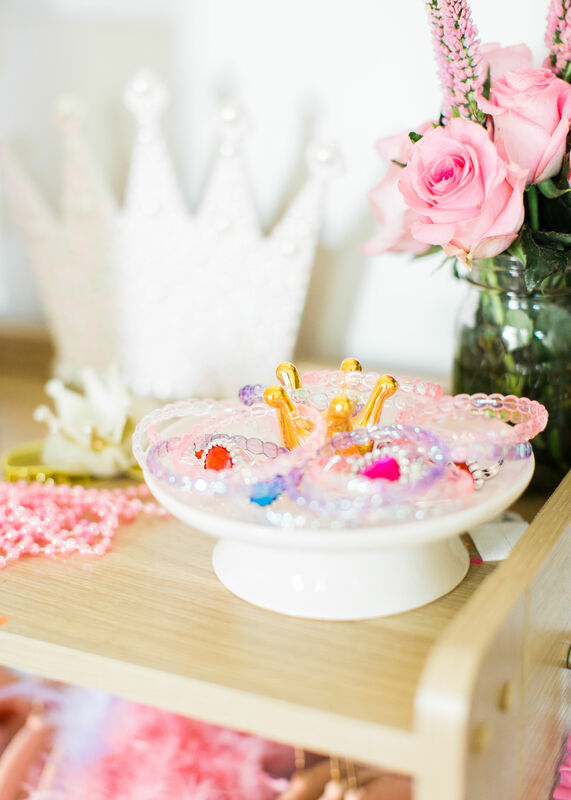 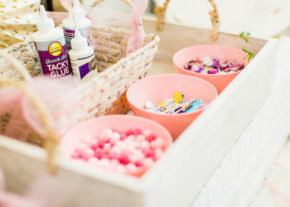 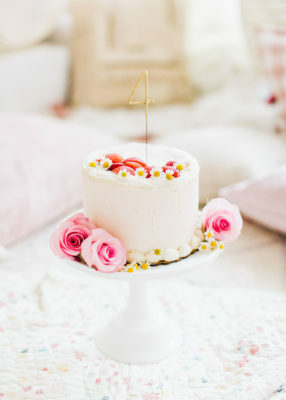 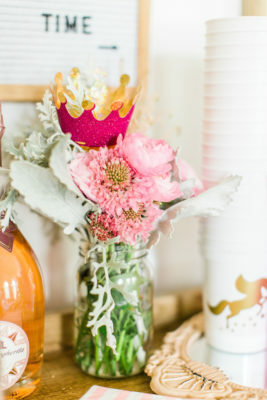 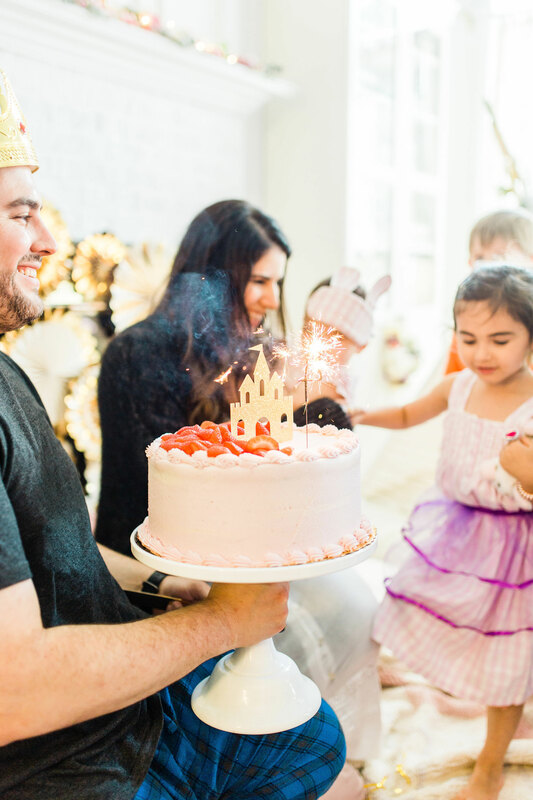 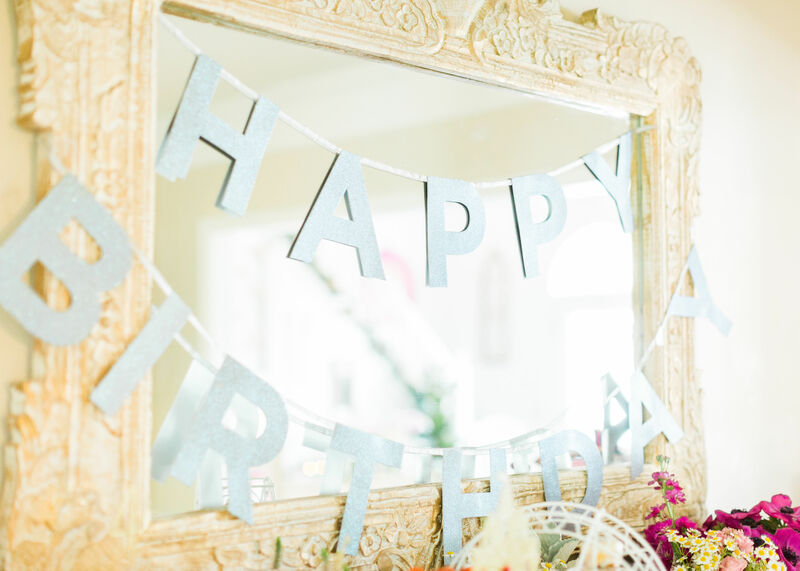 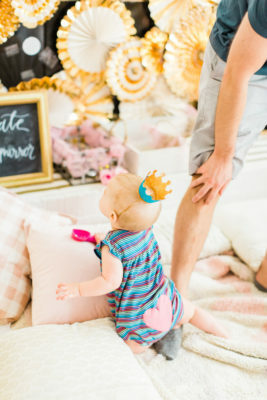 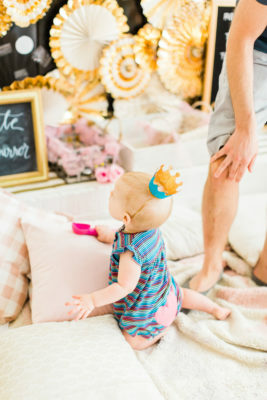 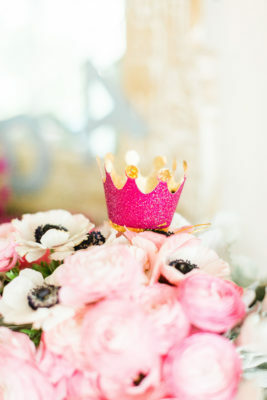 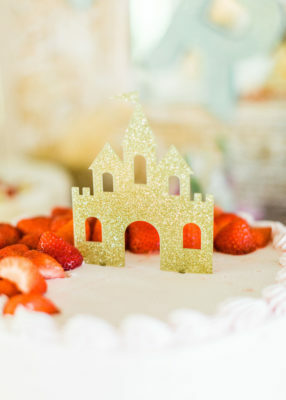 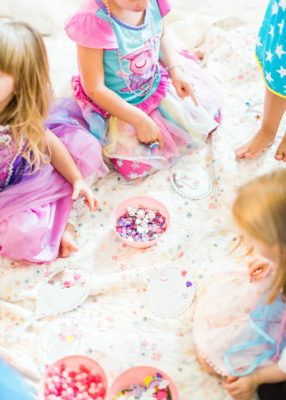 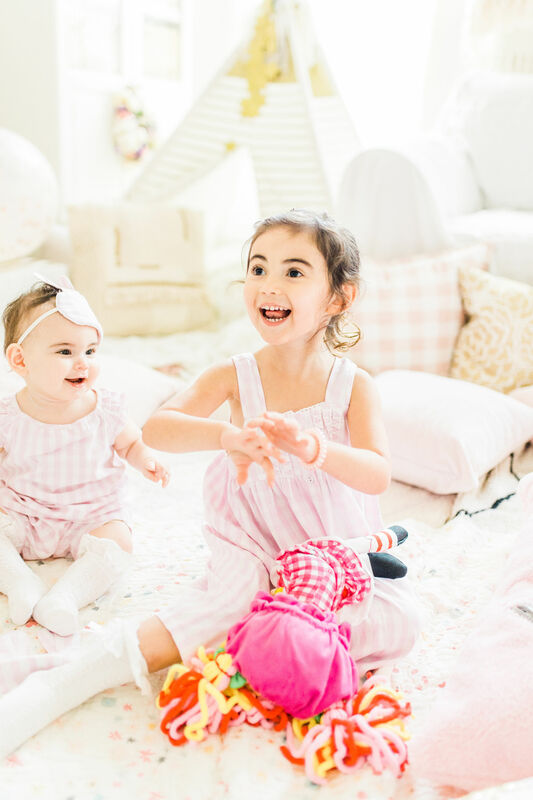 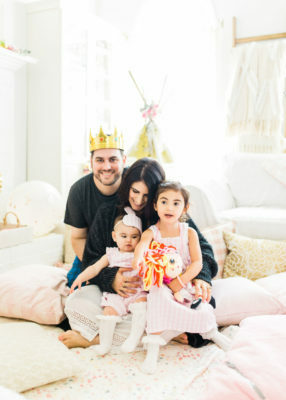 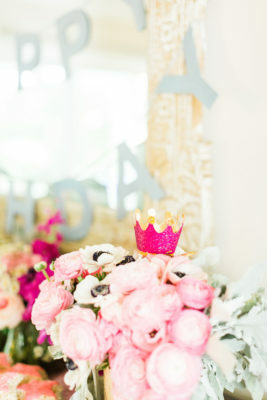 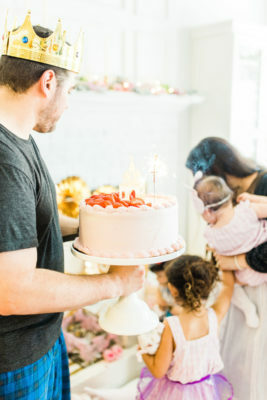 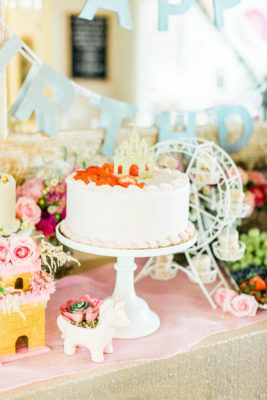 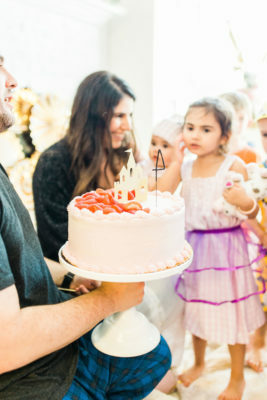 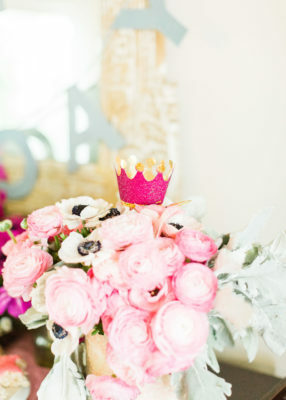 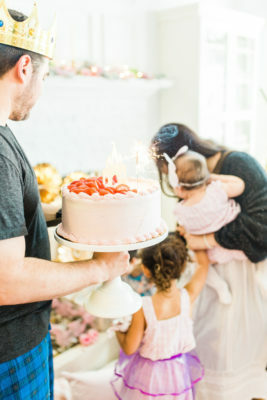 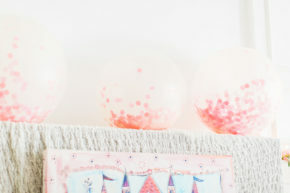 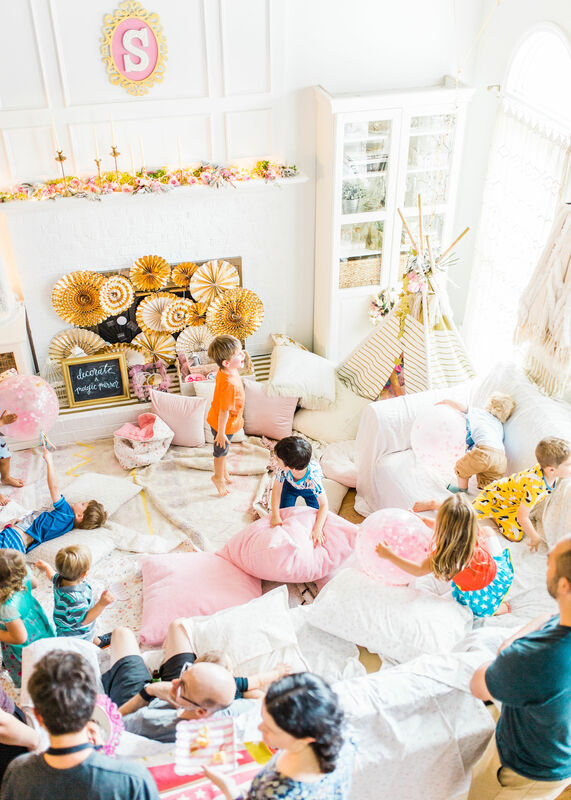 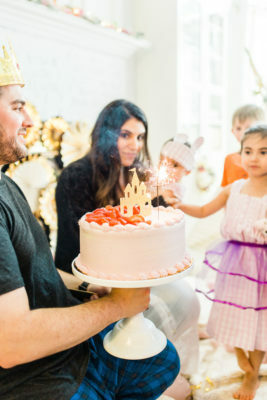 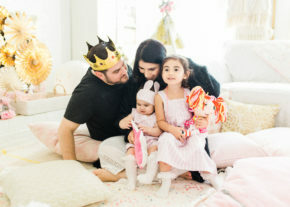 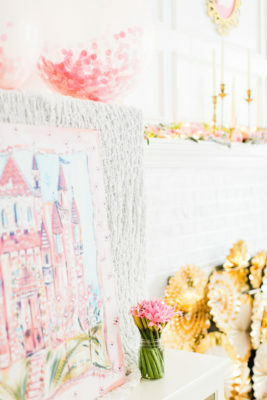 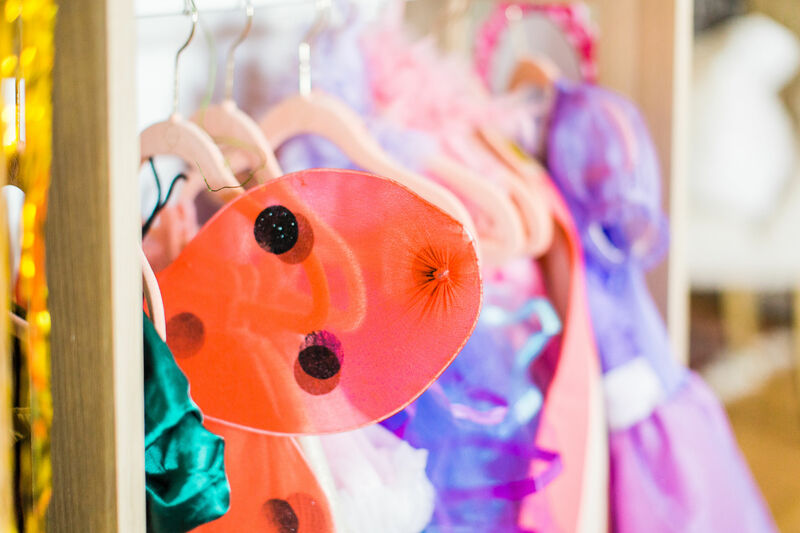 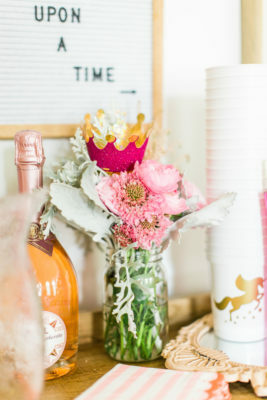 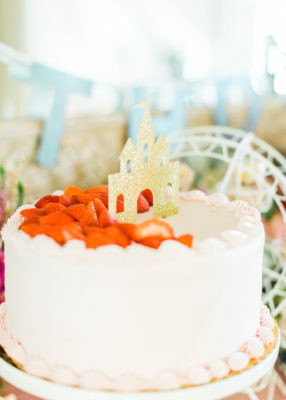 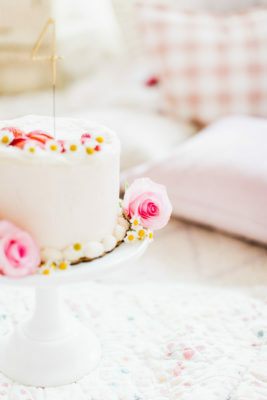 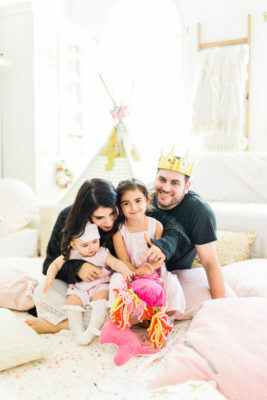 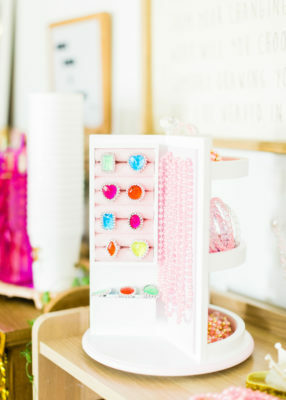 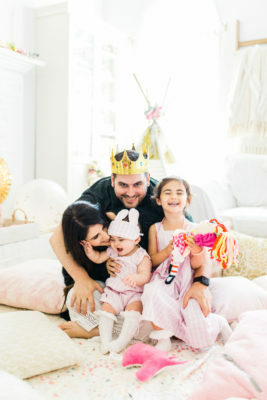 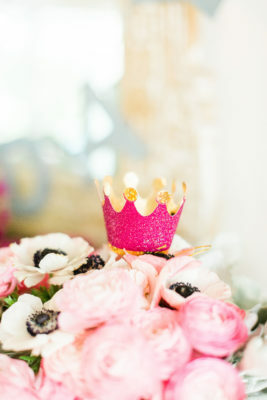 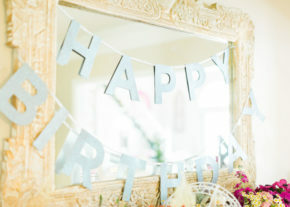 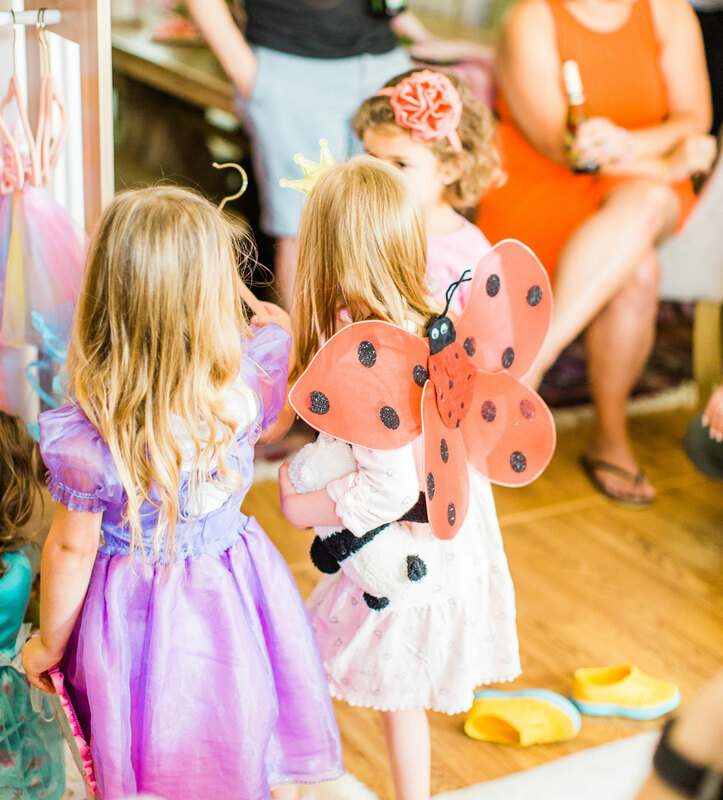 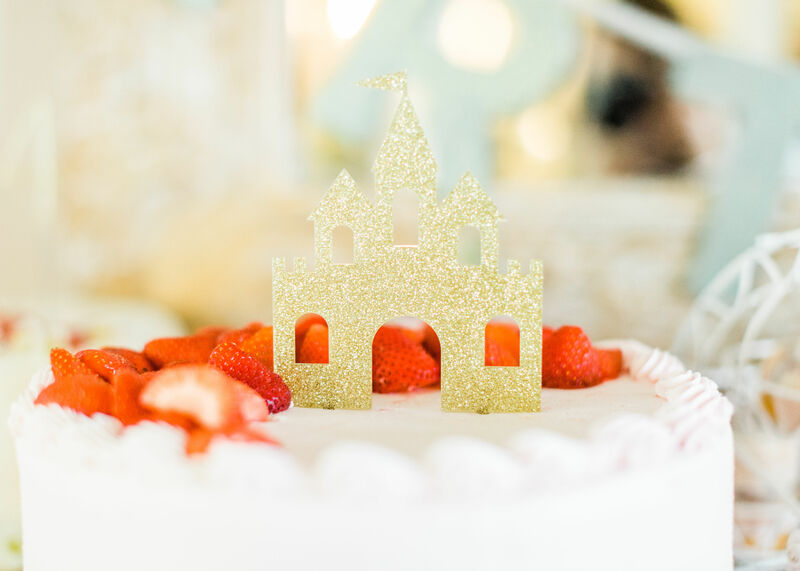 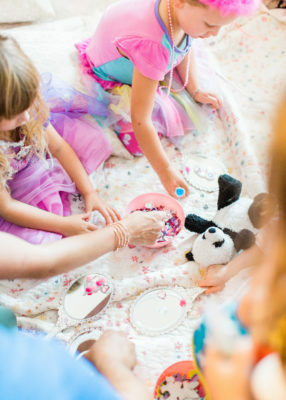 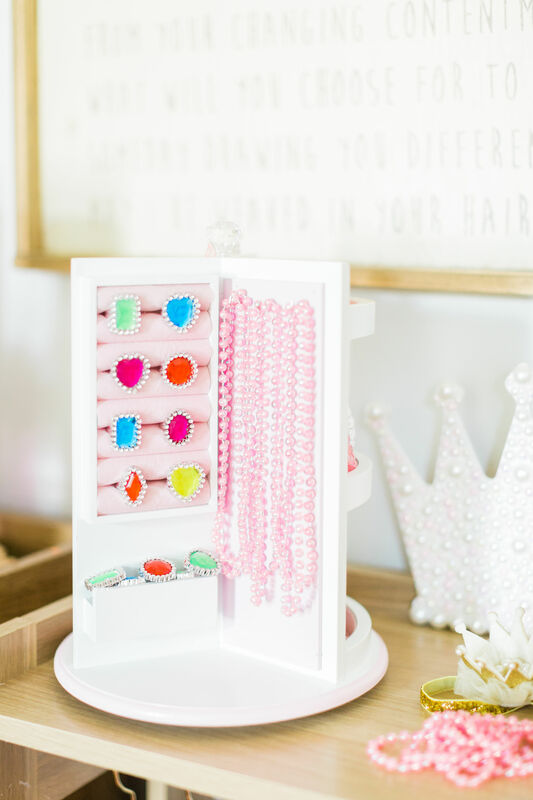 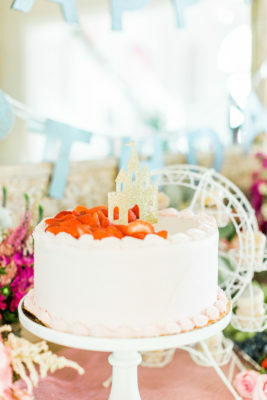 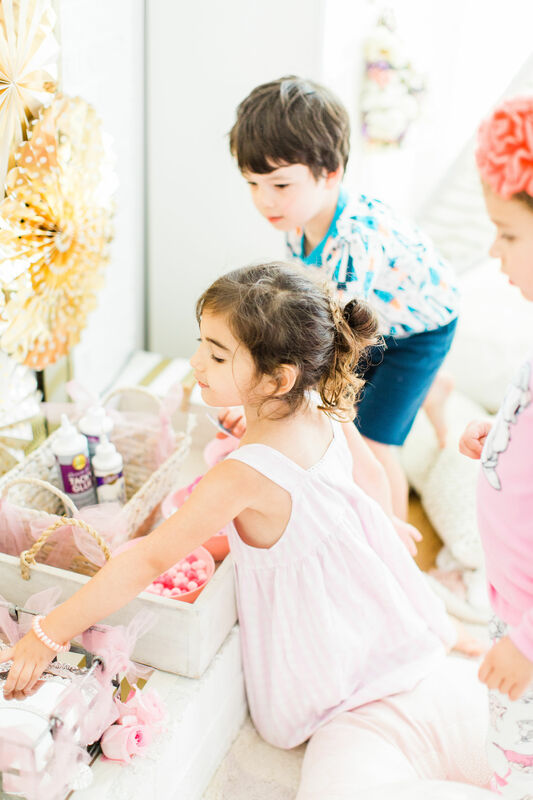 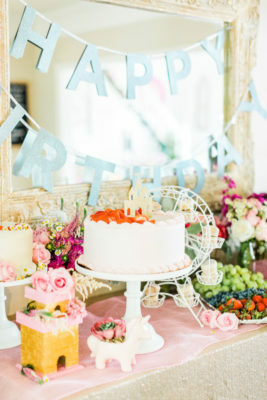 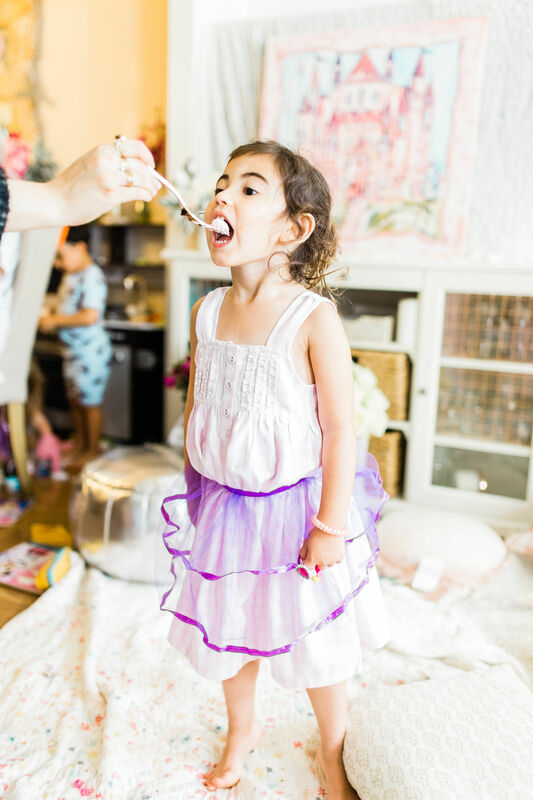 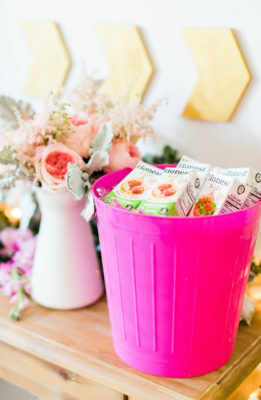 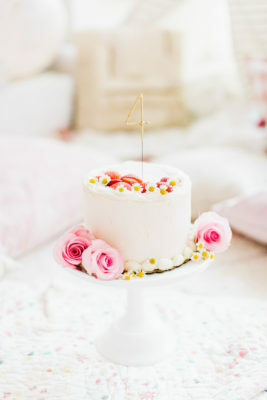 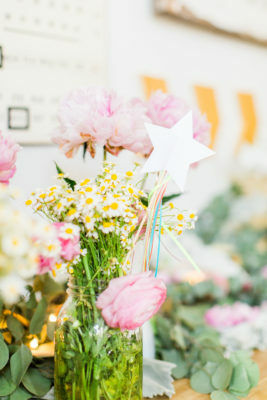 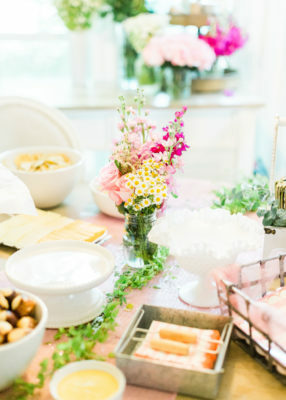 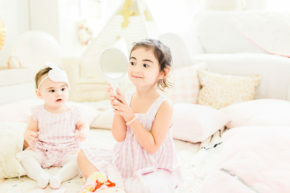 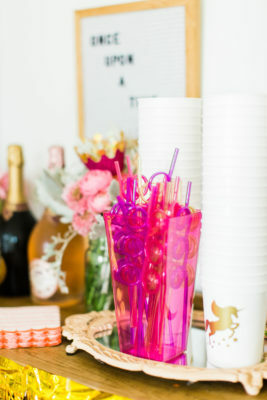 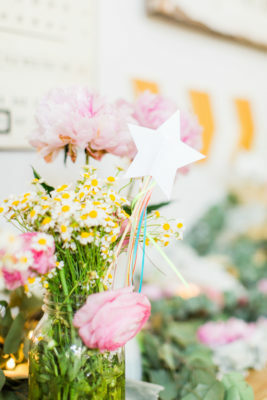 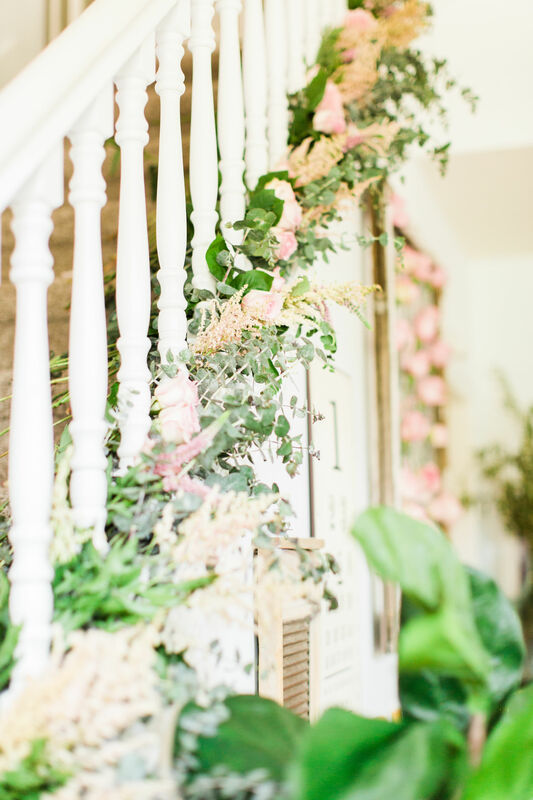 Huge thanks to Kara’s Party Ideas for featuring our little princess’s birthday party, Annie Timmons Photography for taking the most amazing photos (as always! 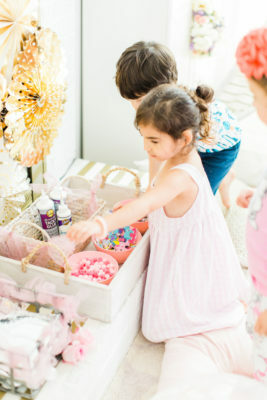 ), my hubby and Michelle (who are the best helpers a girl could ask for! 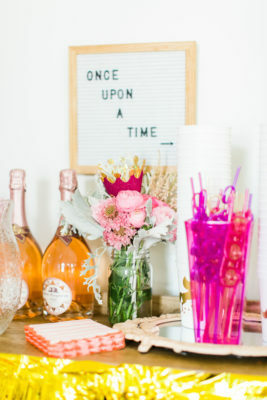 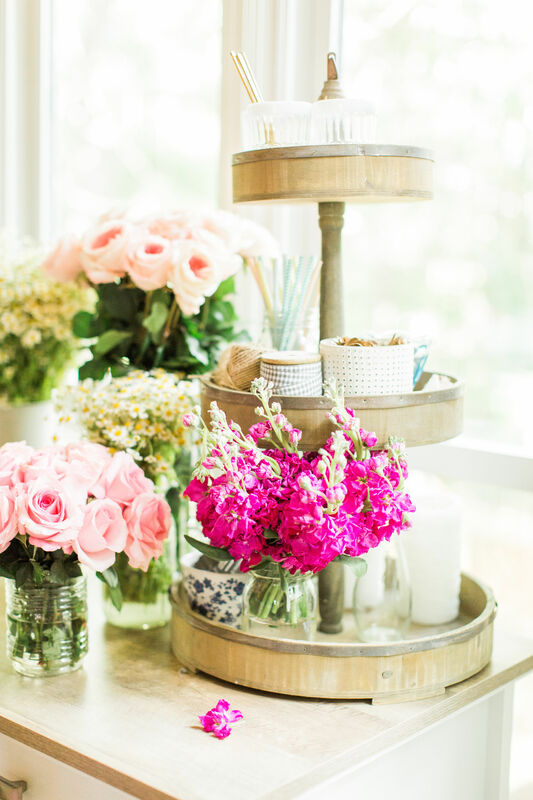 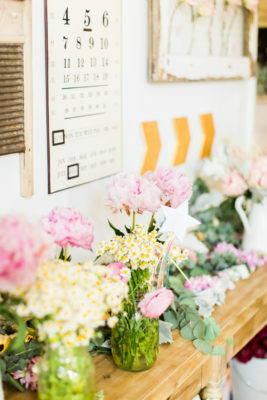 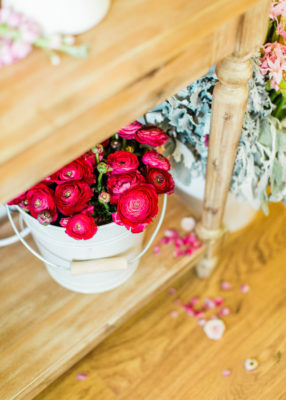 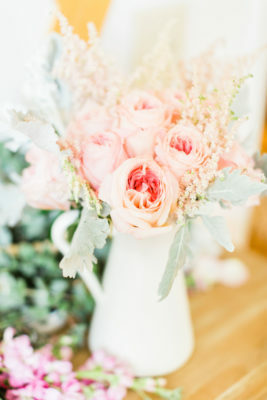 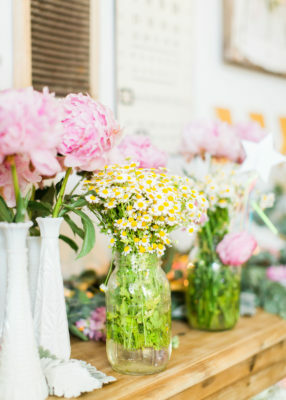 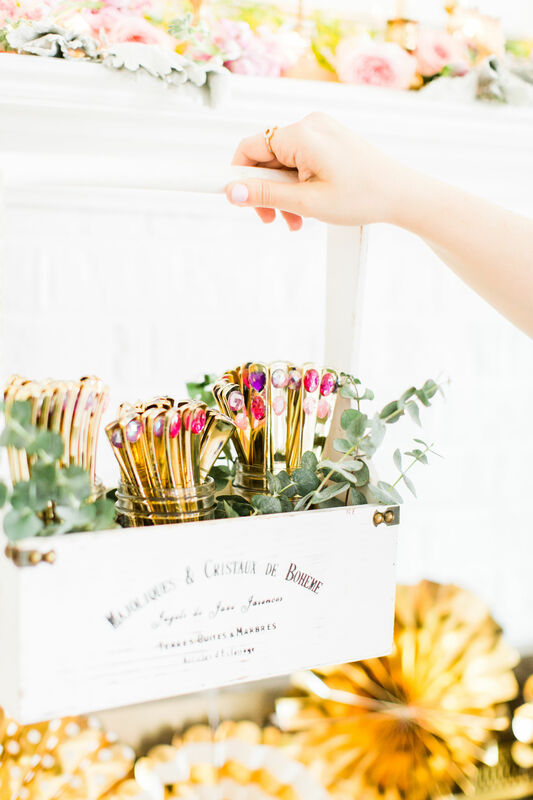 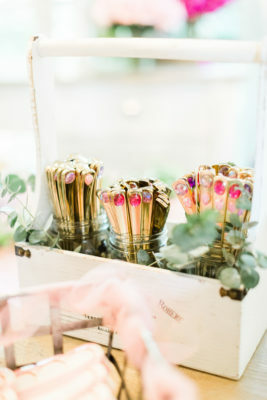 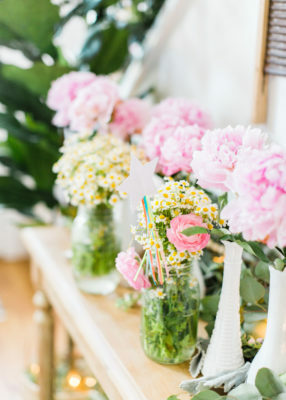 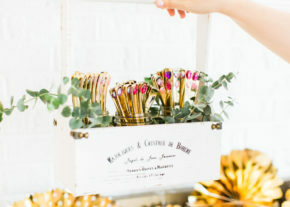 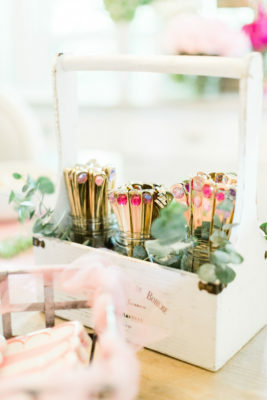 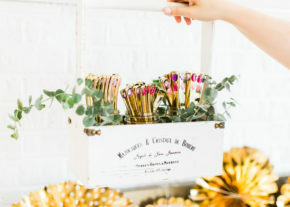 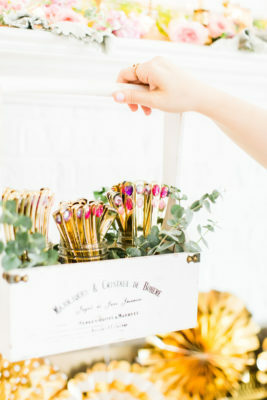 ), and Fifty Flowers, Maisonette, Swoozies, Santa Margherita, and Lorena Canals who provided so many of the beautiful supplies to make our party extra special!